Hello, Shellye McDaniel here with you today! 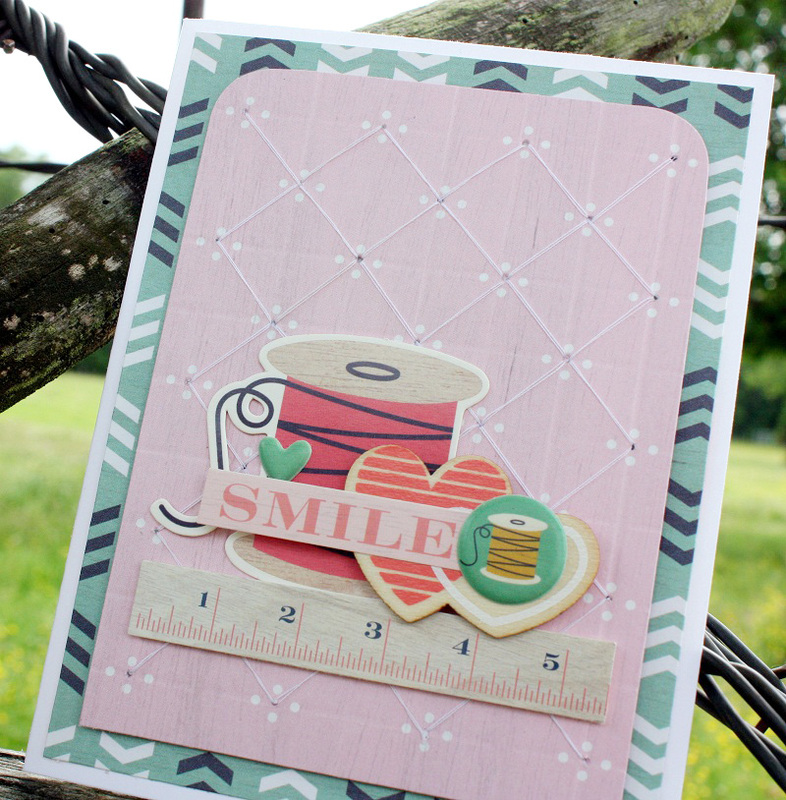 I have a set of cards that I’ve made with the handy DIY Party Fringe & Score Board and the Honey I’m Home Collection. 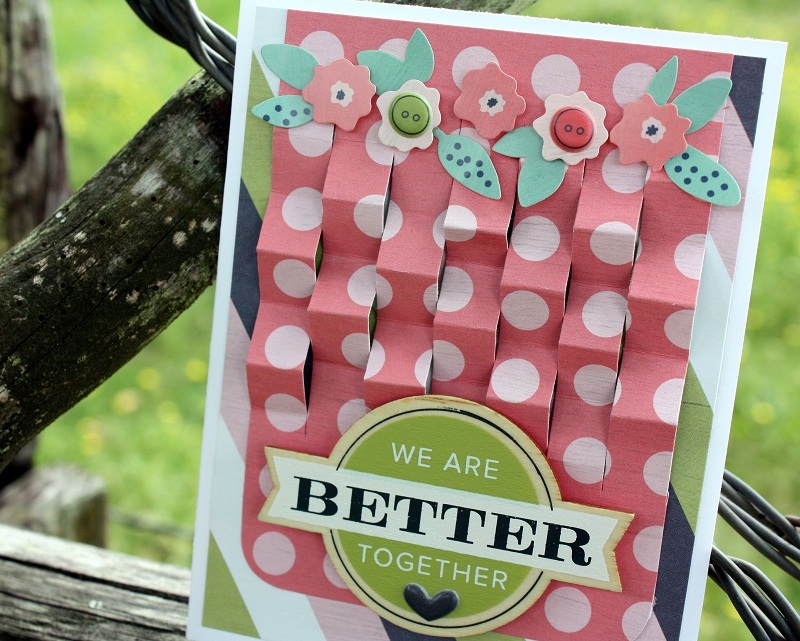 The Fringe and Score Board is great for making fringe, lanterns, tassels, and rosettes, but take a look at how I used it to add some texture and dimension to my cards! 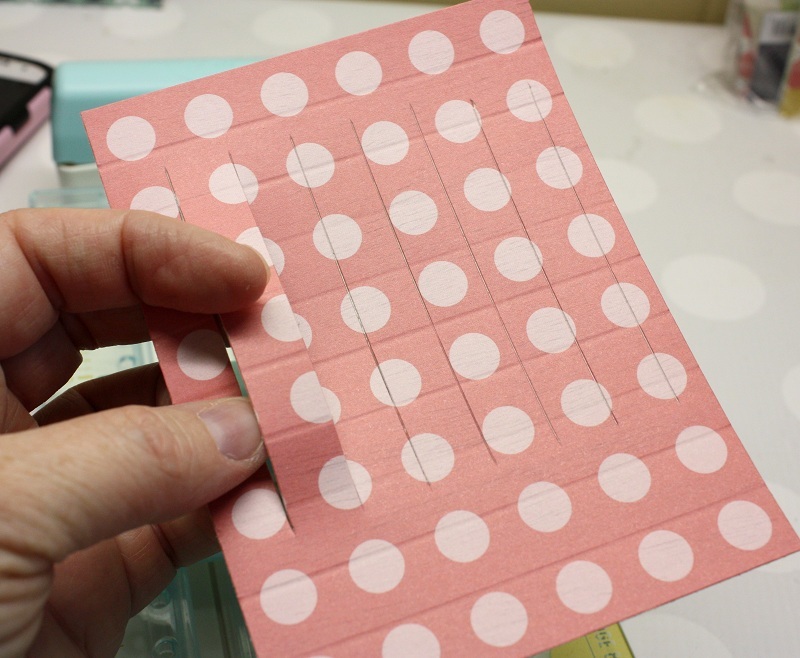 I started by placing a 3.75”X 5” piece of patterned paper onto the Fringe & Score Board. I set the “score” component so that it would score at a ½”. After completely scoring the paper vertically, the paper was turned and then scored horizontally as well. Next I used the Brad Setter & Piercing Tool to pierce a hole at each line intersection. I threaded a standard needle with white thread and then stitched a straight stitched through the holes, connecting them in a diagonal pattern. For the embellishments, I added a couple of wood veneers, chipboard die cuts and puffy stickers. This next card will use both the scoring and fringe components of the system. The 3.75”X5” paper was scored first horizontally at the ½” mark and then turned vertically and cut with the fringe tool at each ½” mark. The areas were then folded in an accordion fashion, alternating each line from up-down-up to down-up-down. 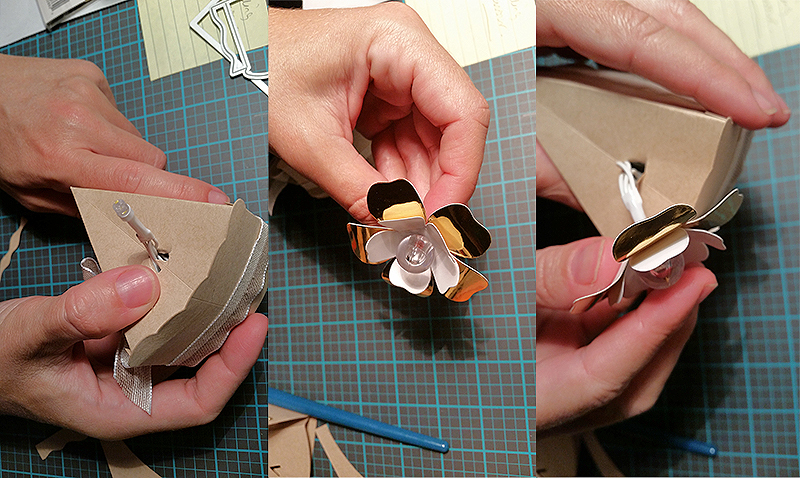 A small dab of adhesive was added to the back where each of the folds went down and then adhered to the base paper. 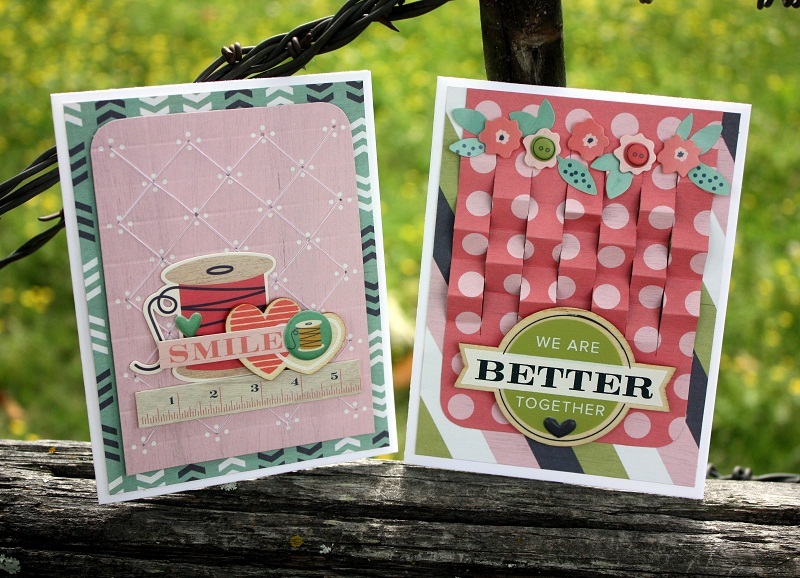 On both cards I allowed the two techniques to really be the focal point and not hidden behind too many embellishments. 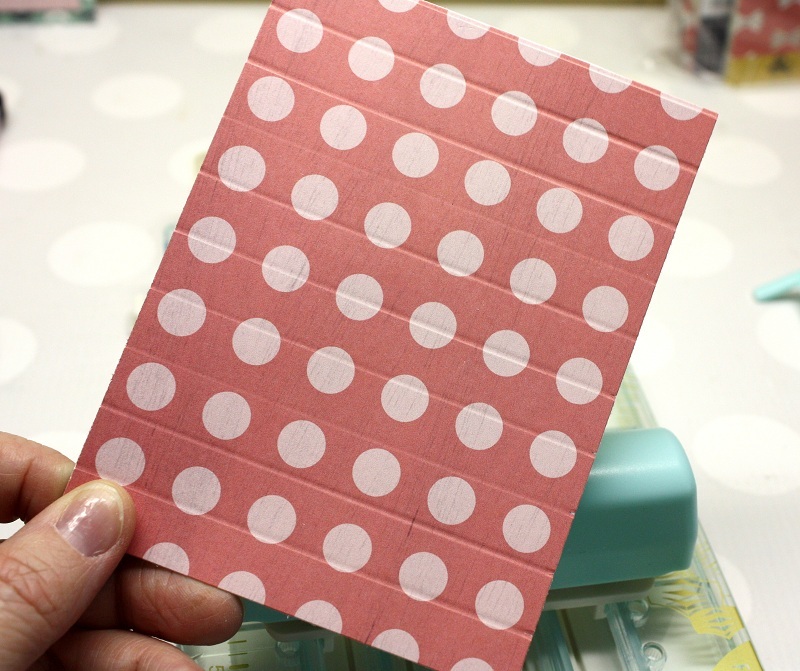 These also make lovely backgrounds for plain notecards or try them on scrapbook layouts! For more information about this versatile tool, check out some Fringe and Score Board videos on our YouTube channel HERE and HERE. Hello WeR fans! 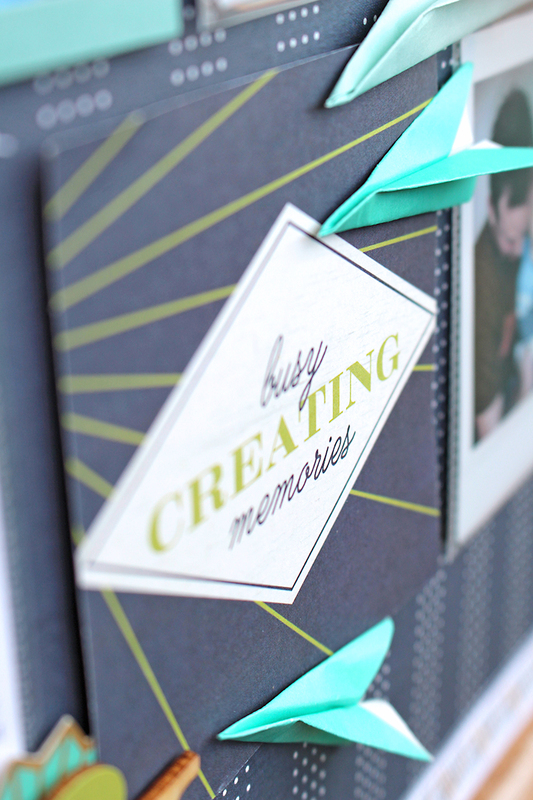 Chantalle back with you today to share some ideas you can incorporate into your scrapbook pages using the Goodie Bag Guide and Oh Goodie! 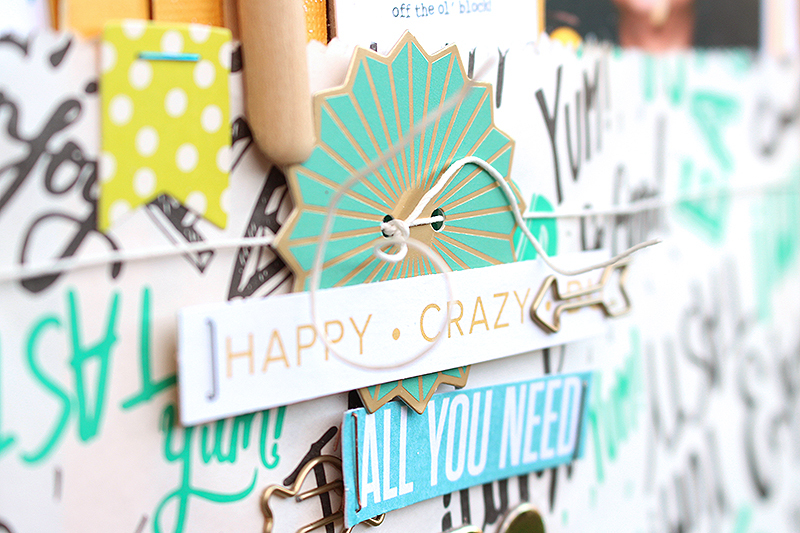 range of papers and embellishments. 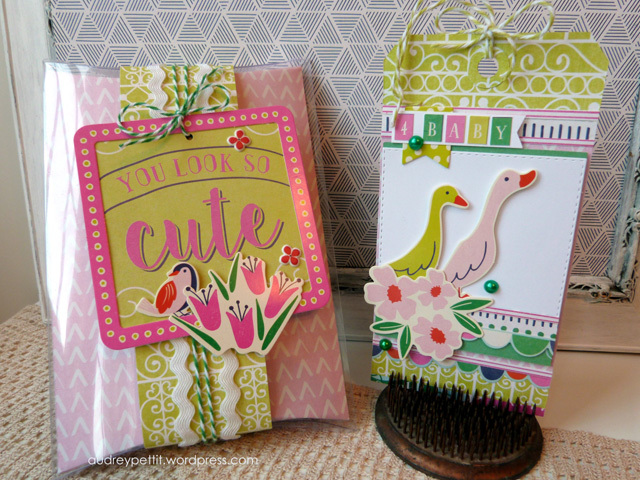 This tool makes adorable goodie bags from the Oh Goodie paper, but you can also use it for other projects. 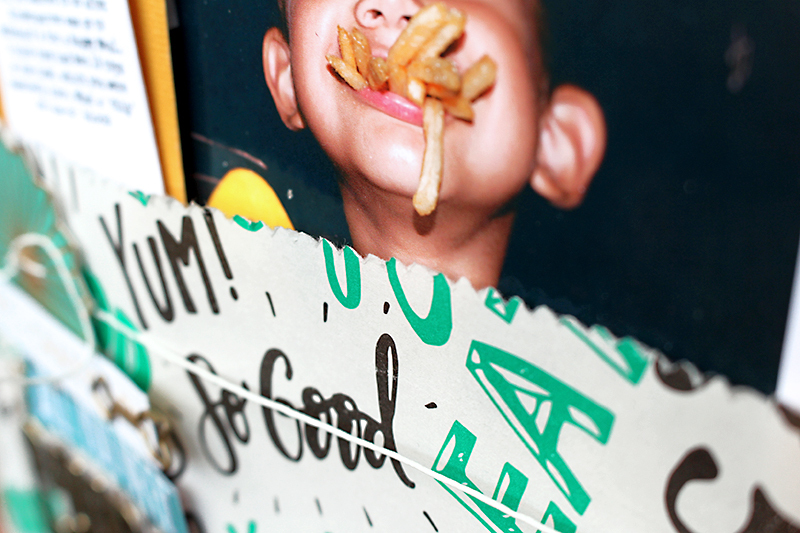 This cheeky snap of my Son with his mouth stuffed to the brim with chippies (or french fries in the US) was perfectly suited to the weight and texture of the glassine Oh Goodie papers. My aim was to recreate the fast food theme so I’ve had some fun fashioning a large packet of fries! As you can see, this page is 8.5 x 11 inches. I’ve used this format so that I could have enough of the 12×12 inch glassine paper to fold over the sides and secure at the back of the page. To give the edge of the packet an authentic feel, I’ve used only the straight part of the Good Bag Guide to tear along the length of the paper. Tip: Slow and steady is the way when tearing your glassine paper. Next it was time to stuff some fries inside that bag! No chip is perfect, so don’t be afraid to rough them up a touch. Complete with a bit of glittery ‘salt’ they are almost good enough to eat, hehe. Creating my fries was a breeze thanks to my Fringe and Score Board. 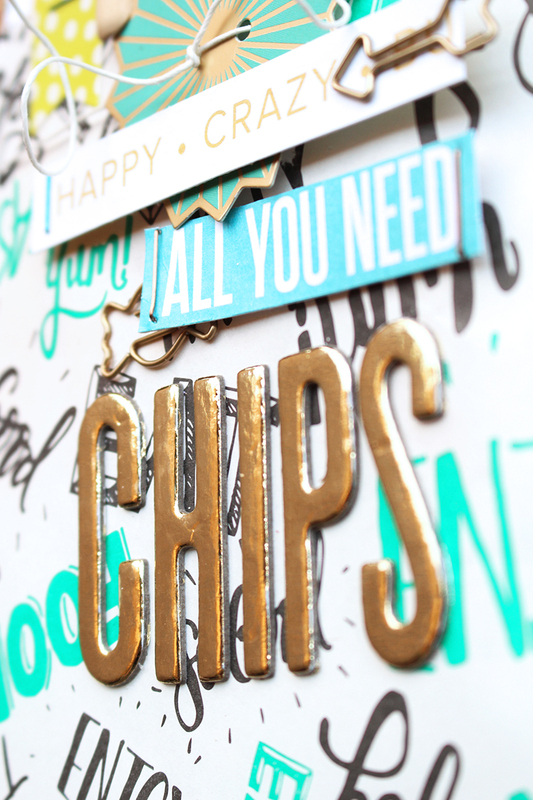 I inserted some yellow cardstock and with one cut, created lots of tasty ‘chips’. 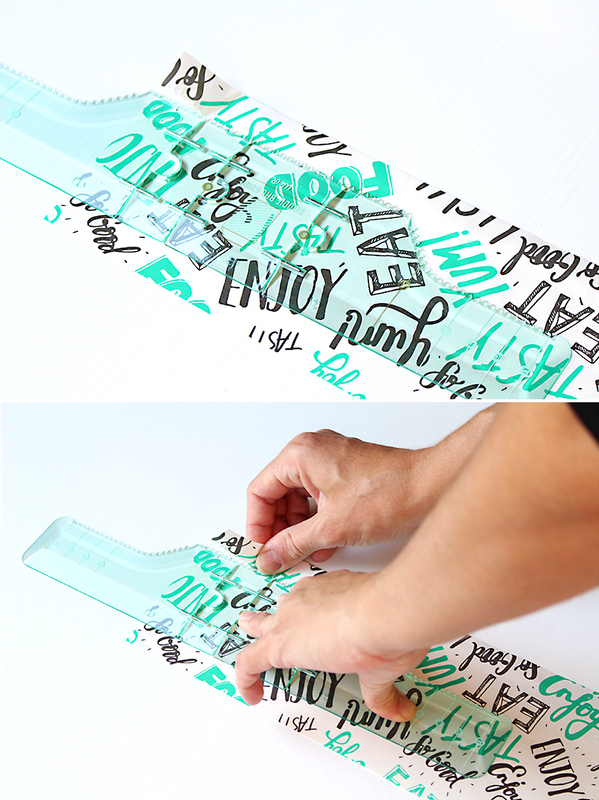 Snip your strips in half and adhere haphazardly with a few on foam tape for some extra dimension. 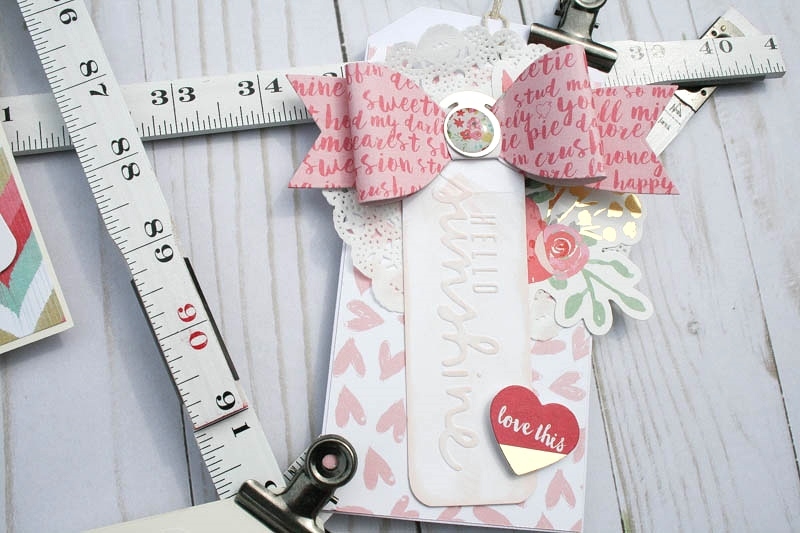 The page was finished off with some sweet Oh Goodie Tags & String, Paper Clips and a cute Vintage Clothespin. I was also inspired to create another page with some glassine touches. 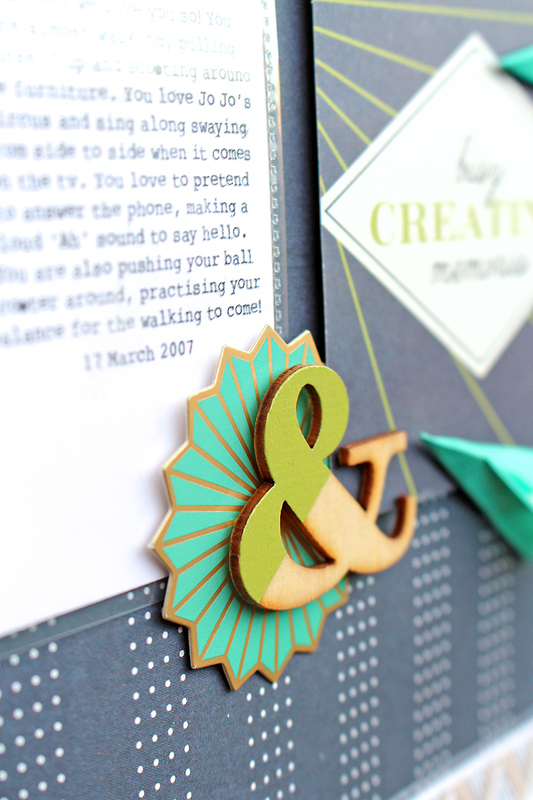 The Oh Goodie papers are a such a fun weight – I’ve used a sheet to create some teeny paper airplanes to use as embellishments. The larger photo has been framed using a clear card and cardstock frame from the Honey I’m Home Frame & Card Kit. The Instax pics are protected from damage by 2×2 Instax size Waterfall Sleeves. These have been machine stitched on to the base paper (Honey I’m Home, Here & Now) for a bit of extra detail. I’ve copied the dimensions of the Instax prints and created my journaling on some white card to match. 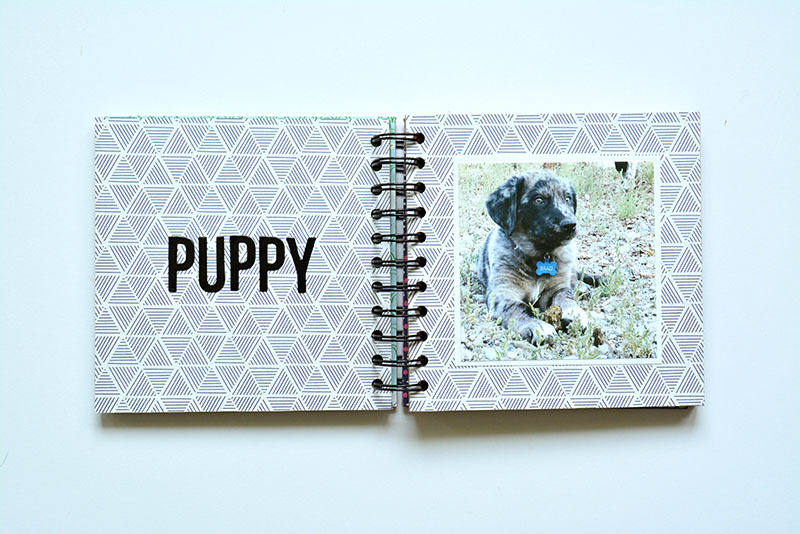 This adds uniformity to the grid design. The base paper has been mounted on to some white cardstock. I’ve trimmed off about ¾ inch from the top and bottom of the navy patterned paper and then with the strips, trimmed them down again so they were about a half inch wide. I’ve reversed them and stitched them down, leaving a small strip of the white peeking through. 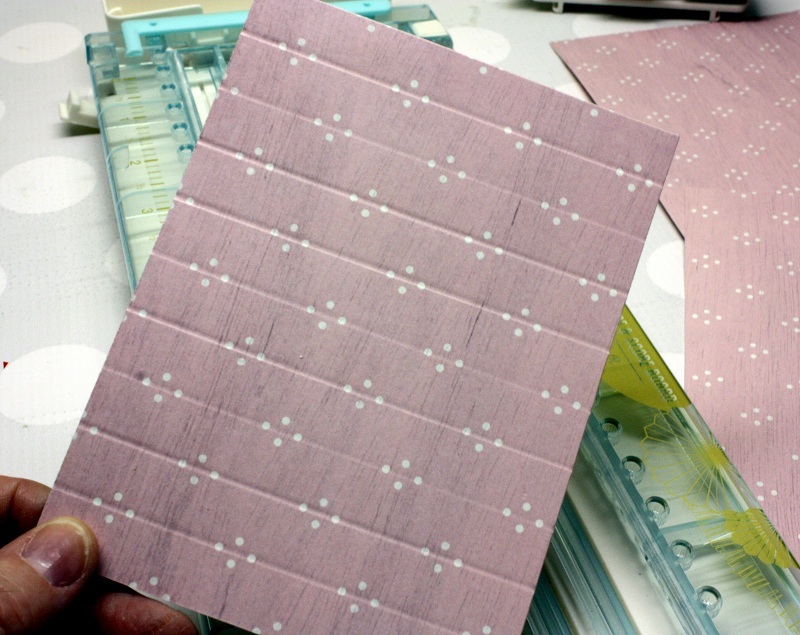 The planes were hand-folded using little squares of the mint Ombré glassine paper. I used a couple of sizes so they weren’t exactly the same. 3×3, 2 ½ x 2 ½ and 2 inch squared. I’ve secured them to my page with a strip of low profile foam tape. 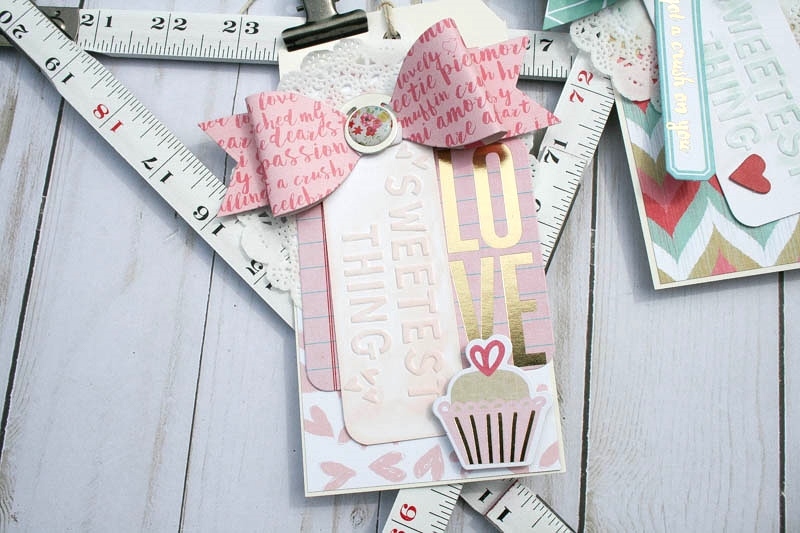 The Oh Goodie Tags make great embellishments. 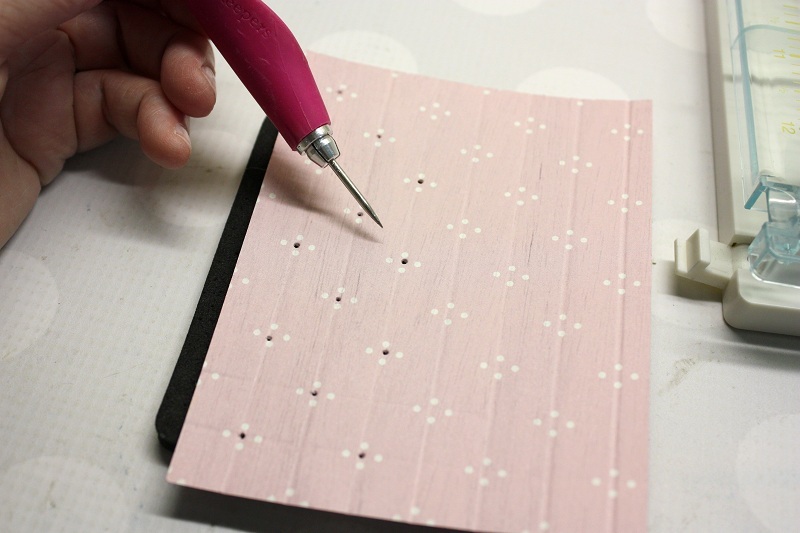 Hide the little holes by layering another embellie over the top like this cute ampersand wood veneer. Oh how I’m missing those sweet baby thighs! The waterfall sleeve makes it feel like a little time capsule. Thank you for joining me today. I hope you have heaps of fun with your Oh Goodie papers! **For more information about the Goodie Bag Guide and Oh Goodie collection you can watch some videos on our YouTube channel HERE and HERE. We have some news We R fans! We’re saying goodbye to one of our design team members, Amanda Coleman, who we will miss dearly. We have loved the amazing projects she has created for us and we wish her the very best. 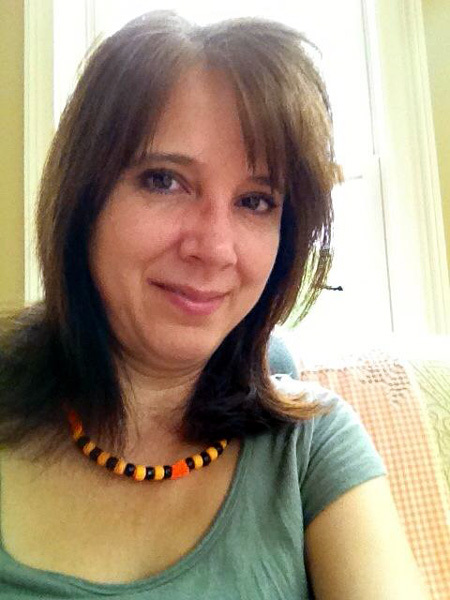 With that, we would like to give a warm welcome to a new design team member, Eva Pizzaro! Take a peek below and enjoy getting to know Eva a little better. 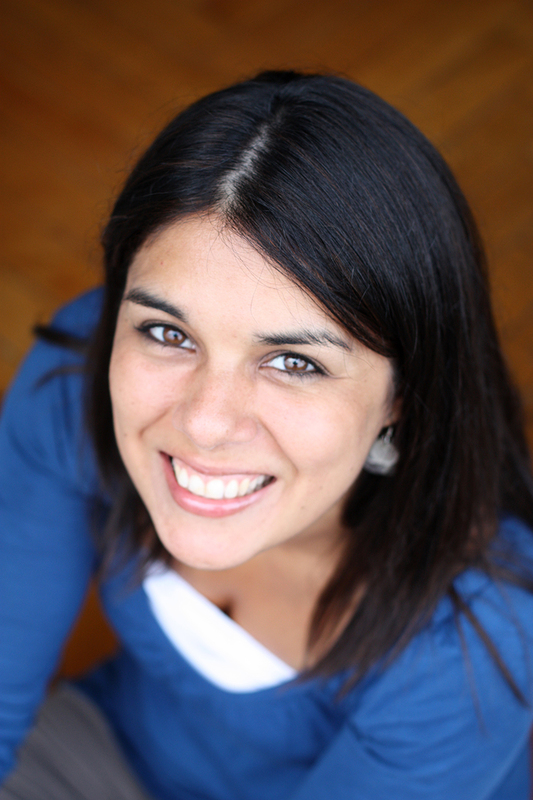 Hi, I’m Eva Pizarro and I live in Santiago, Chile with my husband Marco and our little son Lorenzo. I scrapbook and love everything this hobby does for me. I love to cook, take pictures and enjoy my family. Looking forward to: this time as designer here at WRMK! I am super excited! 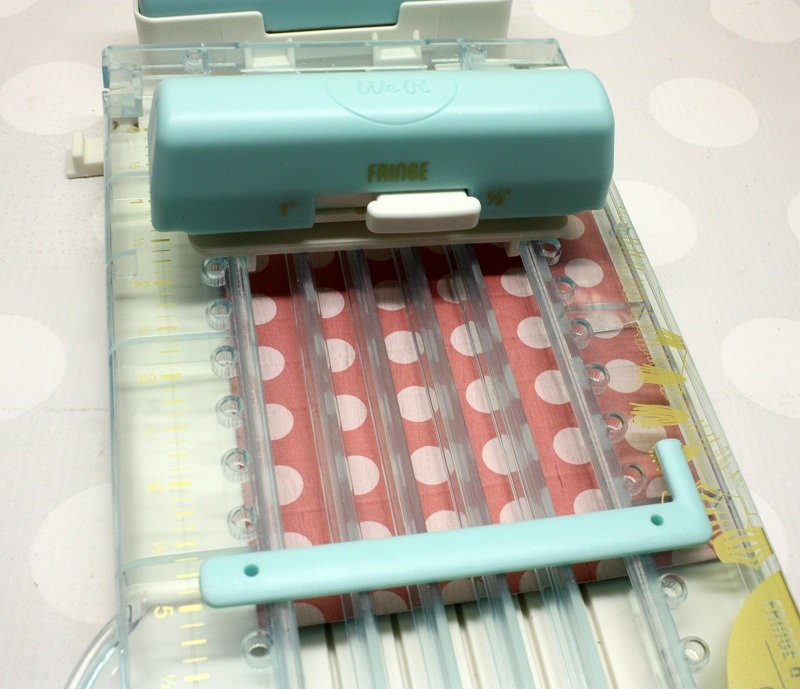 Favorite We R tool or paper collection: I love my Cinch! Since I have it, I can easily create mini albums and mini books! We can’t wait to see what Eva will create for us! 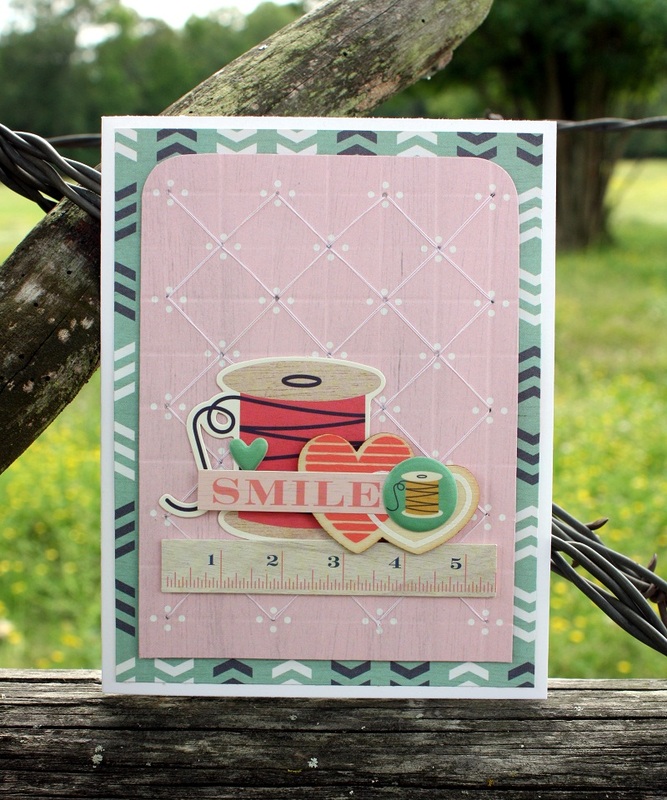 Watch for her projects on the blog starting the end of June! 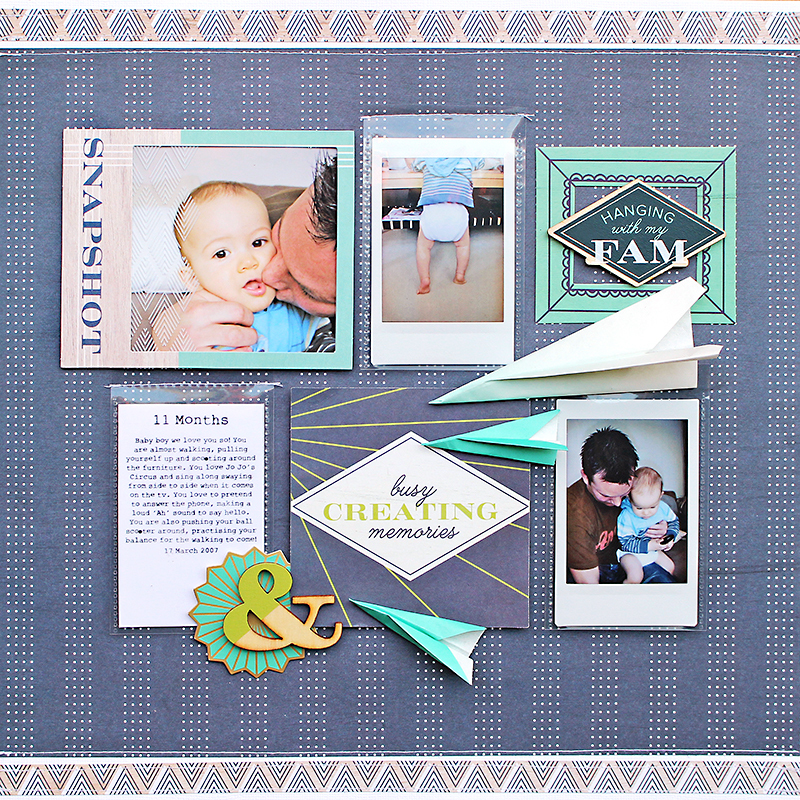 Today we’re so happy to have another guest designer, Audrey Petit, who’s sharing some projects for our final day of Baby Week. First, take a minute to get to know more about Audrey, and then enjoy her beautiful projects below. You’re going to love what she’s created! Hello All! My name is Audrey Pettit. I live in Cary, North Carolina and have two wonderful kiddos, Peter and Nicole. I started scrapbooking and card-making about fifteen years ago after being invited to a friend’s house for a stamping party. That party opened my eyes to a whole new world of paper-crafting, and I have never looked back. 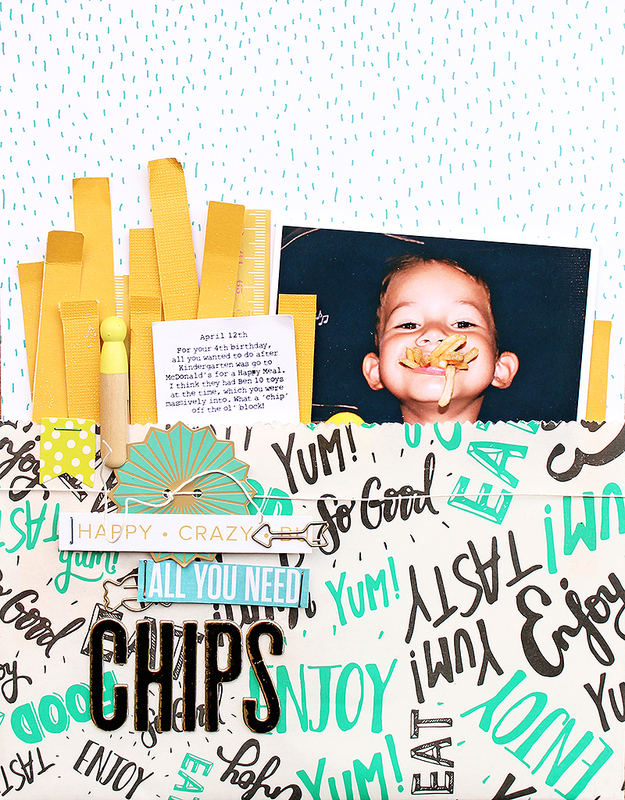 I currently design for Sizzix and Therm O Web. And just this past year, I opened up a little online shop called AudOnes Prims, where I sell my own handcrafted primitive and folk art creations. I love the tools! One of my top favorites has to be the envelope punch board. This week is baby week here on the We R Memory Keepers blog, and so today I have a sweet and girly baby gift set to share with you, made with the adorable new Flower Girl collection. 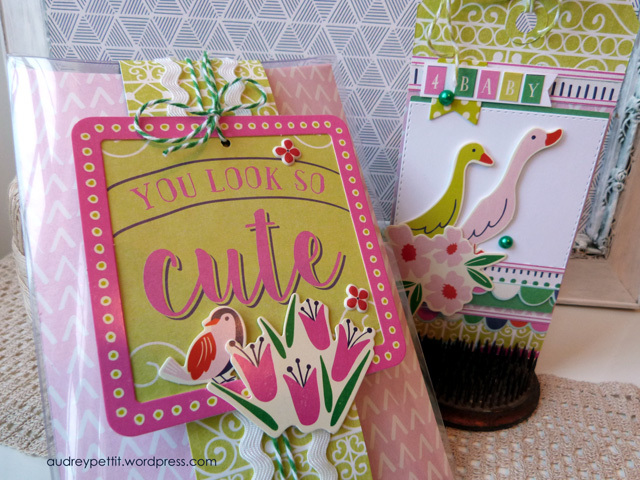 I am a huge fan of creating scenes for the focal point on my card designs. 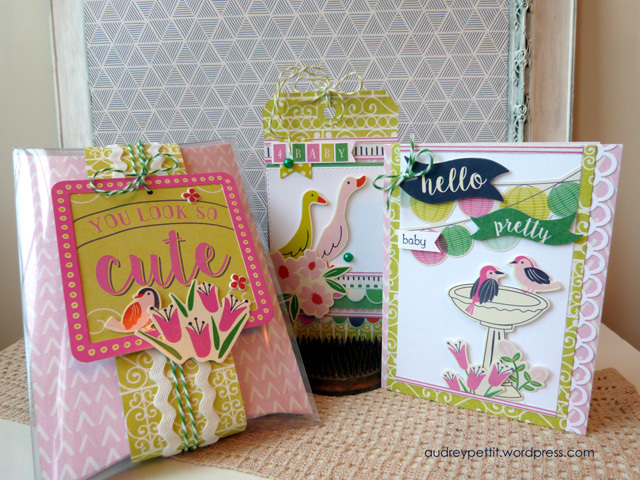 For my Hello Pretty Baby card, I made a fun garden party scene using a mix of Accent Stickers and die cuts from the Ephemera Pack. Foam adhesive between the layers helps add definition between all the pieces and adds a sense of depth to the scene. 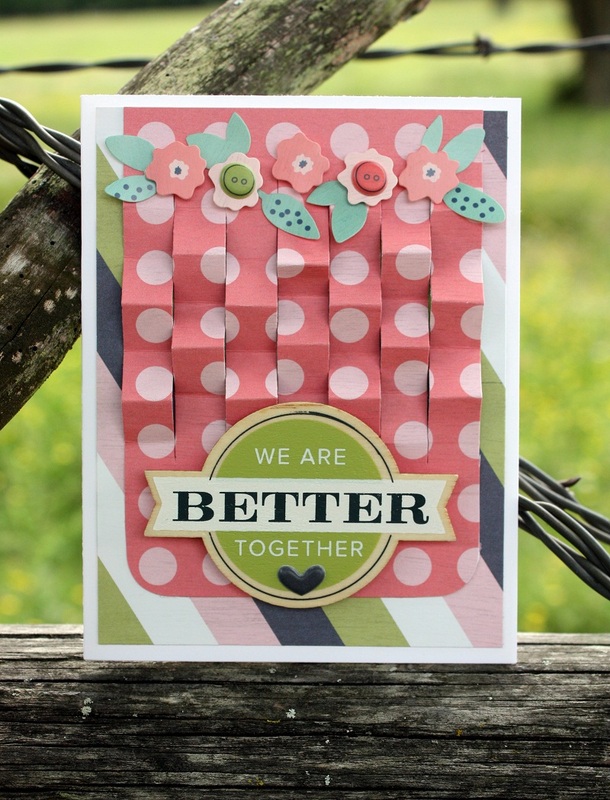 The sentiment was made using a combination of a die cut banner and a second banner fussy cut from the patterned paper. I added a simple baby word stamp from the stash to complete the scene. I think this card is so cute for a new baby gift, or would work great for a baby shower, too. I think my favorite pieces from the Flower Girl collection have got to be the adorable ducks I used on my tag. Absolutely love them, and since I had used some birds on the card, I noticed a theme starting. 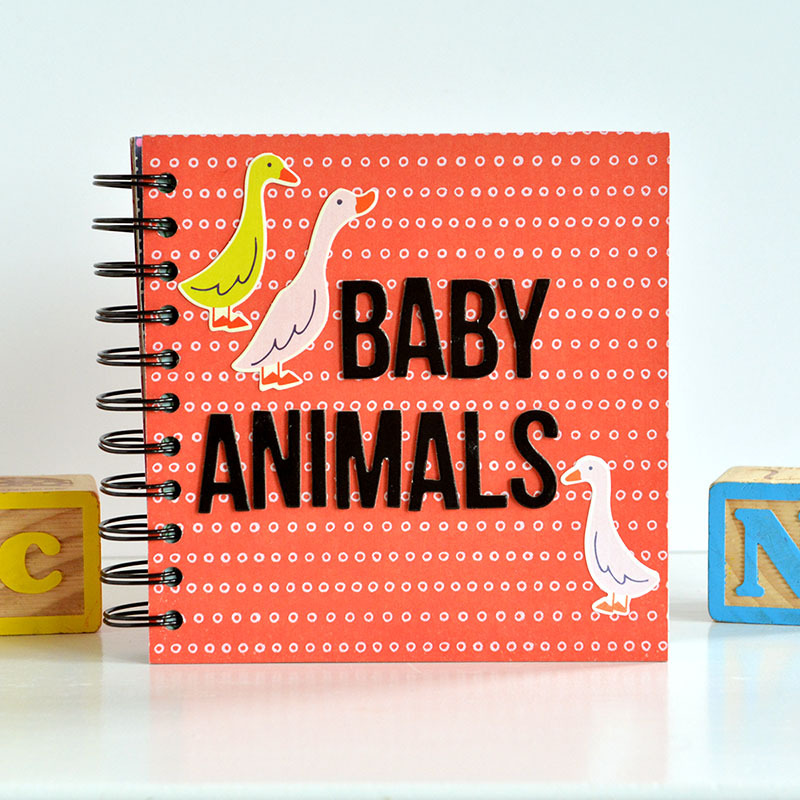 I do love animals on baby projects. To keep the set looking cohesive, I decided to repeat some of the same elements from the card. So once again, I created a fun little scene for the tag using die cuts and stickers, pulling in some of the flowers and papers from the card. Since I had used adorable die cut birds on my first two projects, of course I had to add one final bird to the gift packaging to complete the set. For this fun pillow box package, I recycled some old plastic packaging for the base, and dressed it up with matching papers and tag. It’s really easy to slip a piece of patterned paper inside the clear box, and a simple belly band sleeve keeps everything closed. Then just tie up your package with ribbon and a fun hang tag. So quick and easy. And I love how everything coordinates. Thank you so much for stopping by! Wishing you all a wonderful day! Hello We R fans! 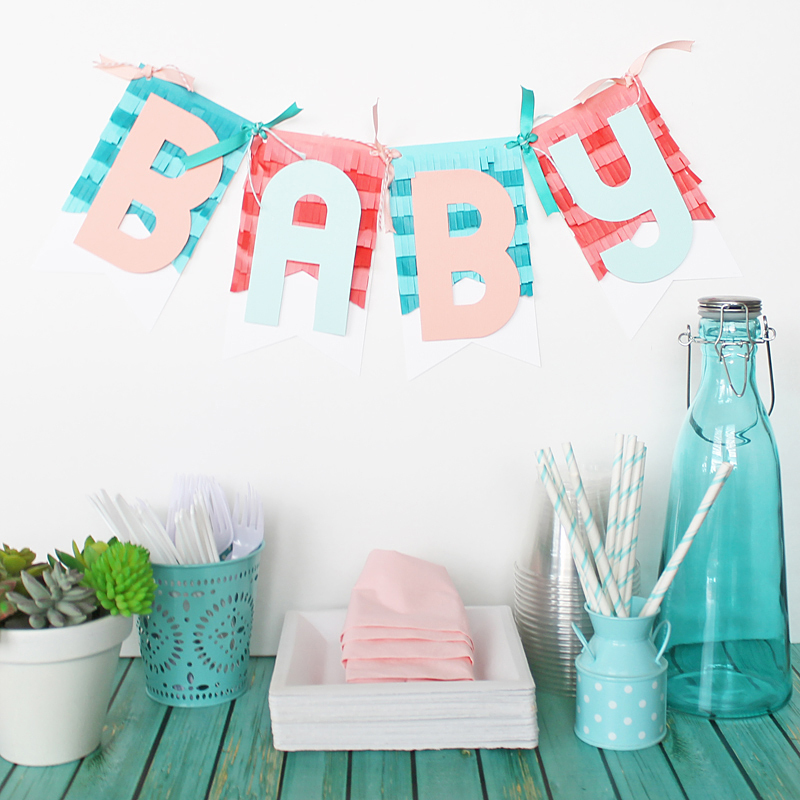 It’s Aly here to share a fun baby shower idea with you. Recently I had the chance to share some honeycomb paper party ideas on a local Utah daytime talk show, Studio 5. 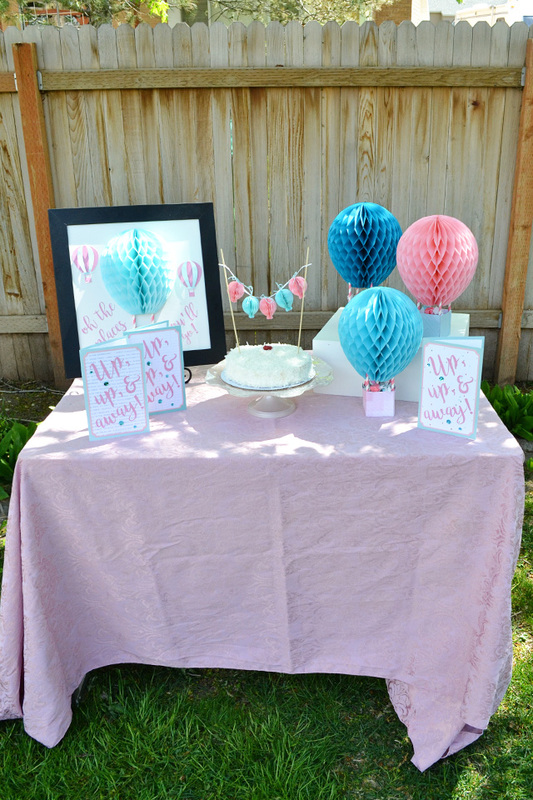 This baby shower or toddler party idea was one of them. I love the hot air balloon trend, and thought it would be fun to combine it with the texture of the honeycomb paper. A match made in heaven, don’t you think? First I created a fun framed sign that can be hung on a wall or used as a table centerpiece. I added a honeycomb hot air balloon in the center and then a small patterned paper basket underneath attached with paper straws . I used my electronic die cutting machine to cut some smaller hot air balloons and the title of one of my favorite Dr. Seuss books . 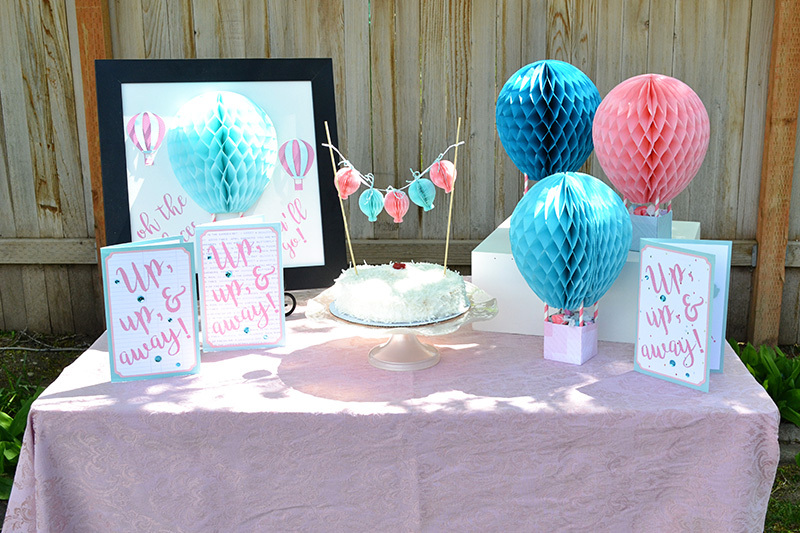 I think these are my favorite projects in the set–hot air balloon party favors! 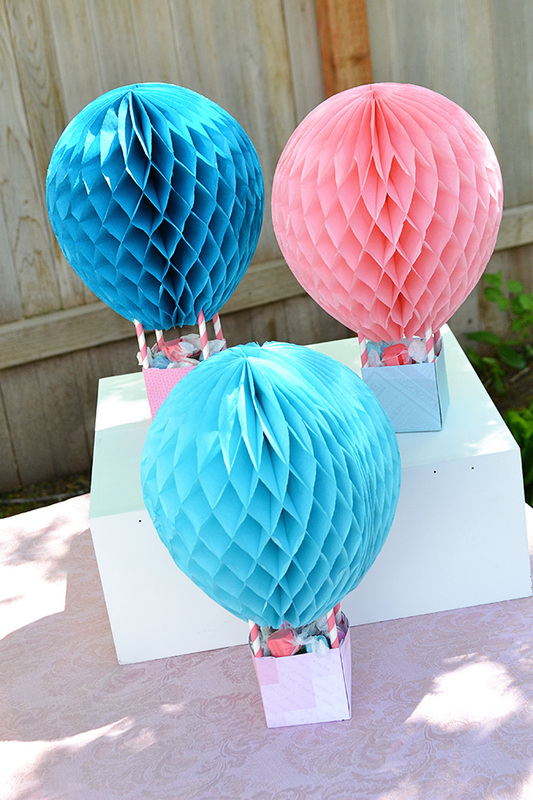 I attached paper boxes I made with my 123 Punch Board to the bottom of the honeycomb paper hot air balloons using paper straws, and then filled them with saltwater taffy. So fun! 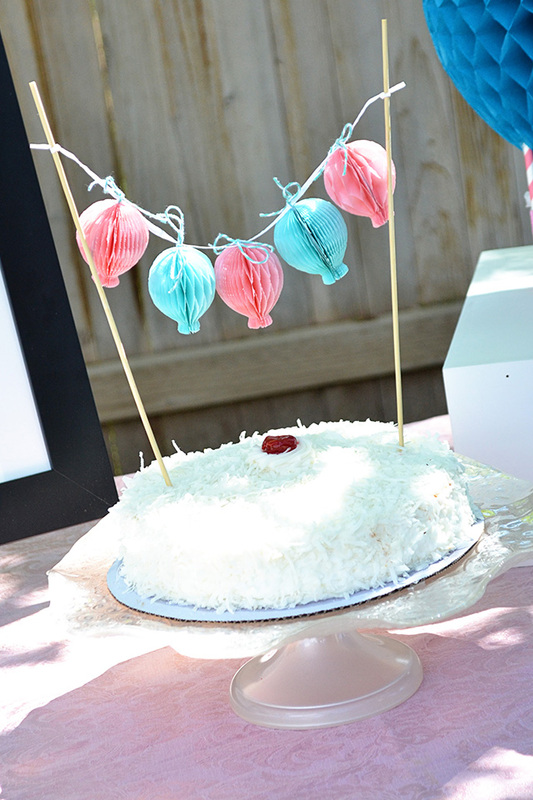 How cute are the mini hot air balloons on this cake topper? I attached them with baker’s twine between some simple bamboo skewers, and poked them into the cake. 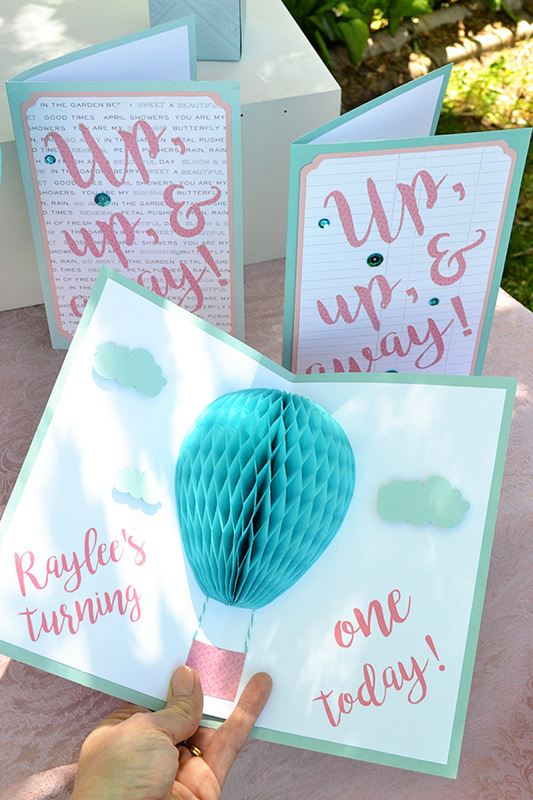 And, finally here’s a fun idea for a DIY party invitation–a pop-up honeycomb hot air balloon card! 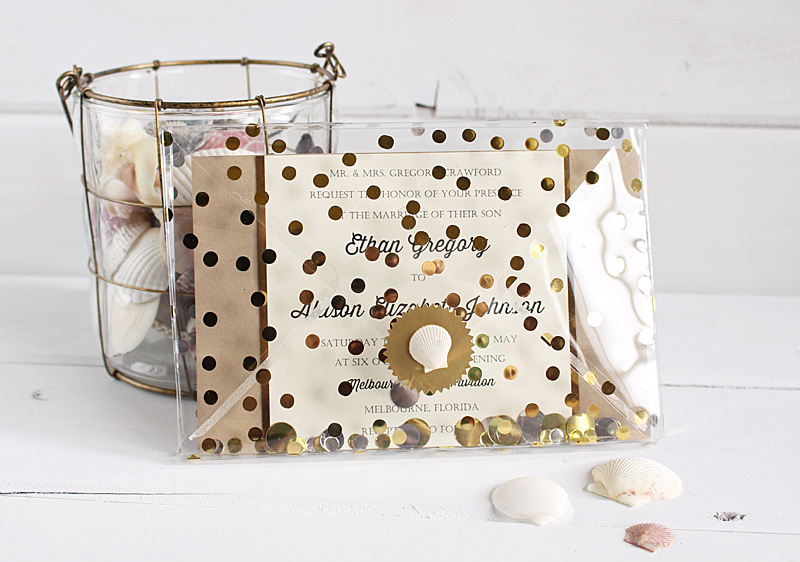 Your guests will love the fun surprise when they open the invitation. 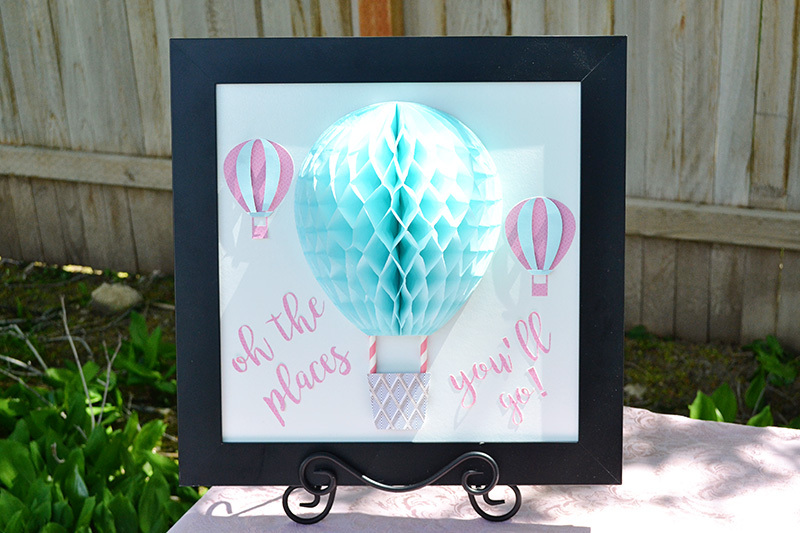 It was easy to create all of these hot air balloon shapes in various sizes and colors with the DIY Party Honeycomb Pads and Stencils. Visit our YouTube channel HERE for helpful project and overview videos. 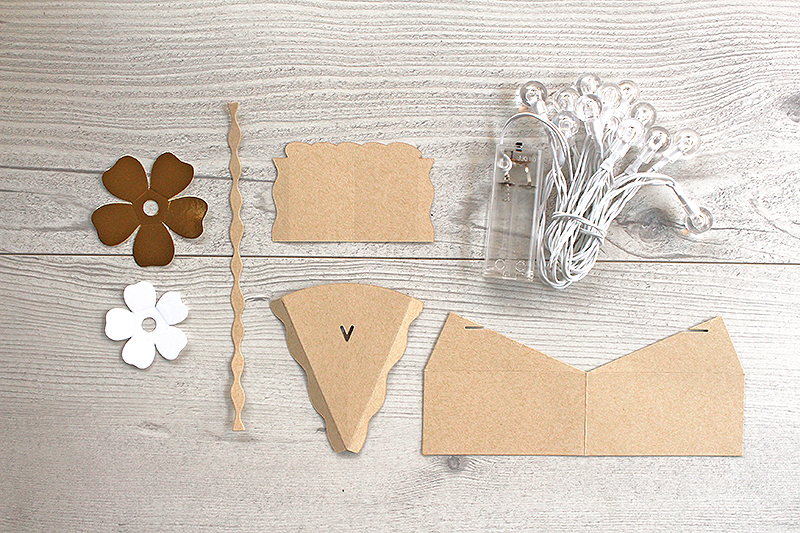 What kind of party would you use honeycomb paper decorations for? Hello, We R fans! 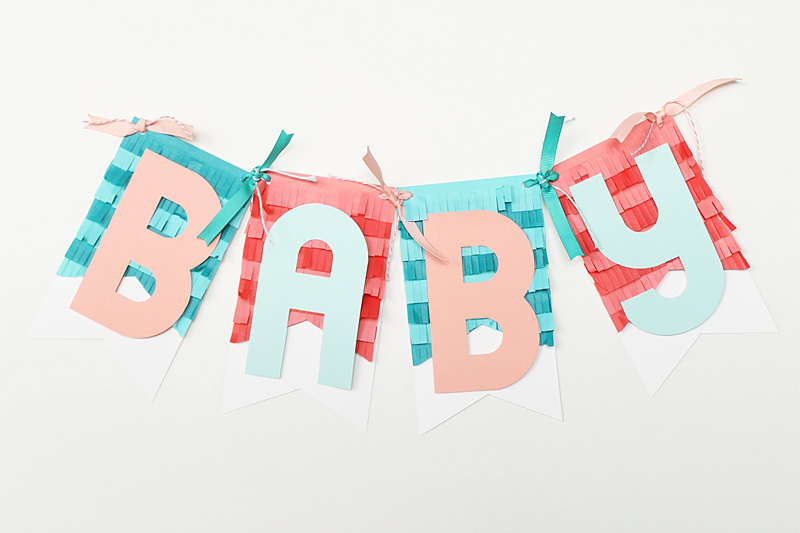 Laura here showing you a cute baby banner that would be perfect for a baby shower or birthday party. 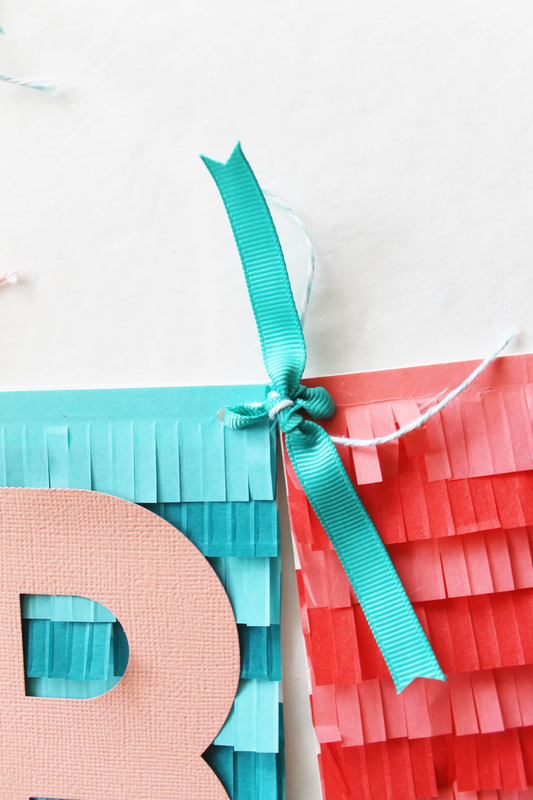 A little fringe and some simple letters are all you need to make this banner shine. 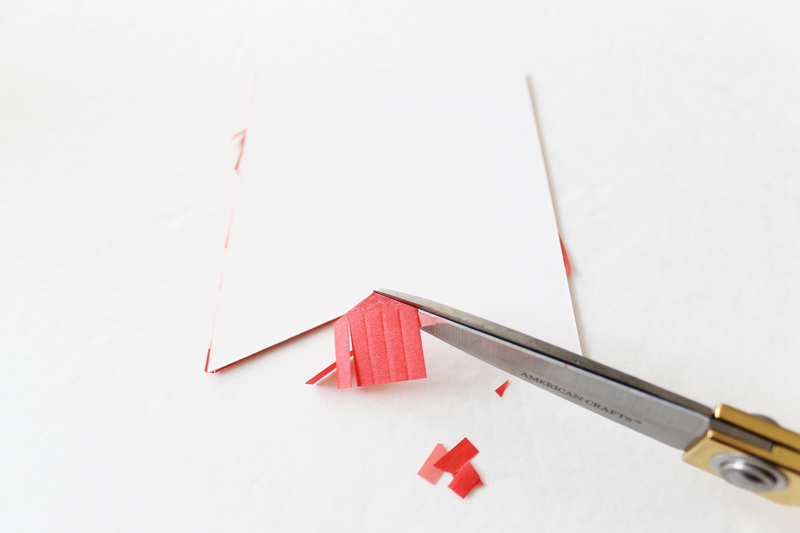 Start by trimming a piece of white textured cardstock four inches wide. Using the Banner Punch Board, cut a flag shape on one end of the banner. Trim the overall banner length to seven inches long. Punch holes in the top of the banner piece. You will need four of these banner shapes. 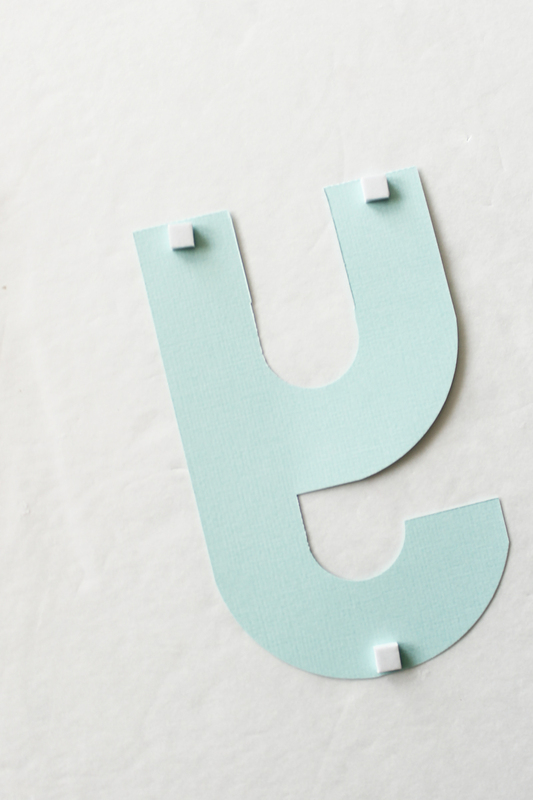 Cut a piece of plain white cardstock four inches wide. Again, using the Banner Punch board create a flag shape on one end of the banner. 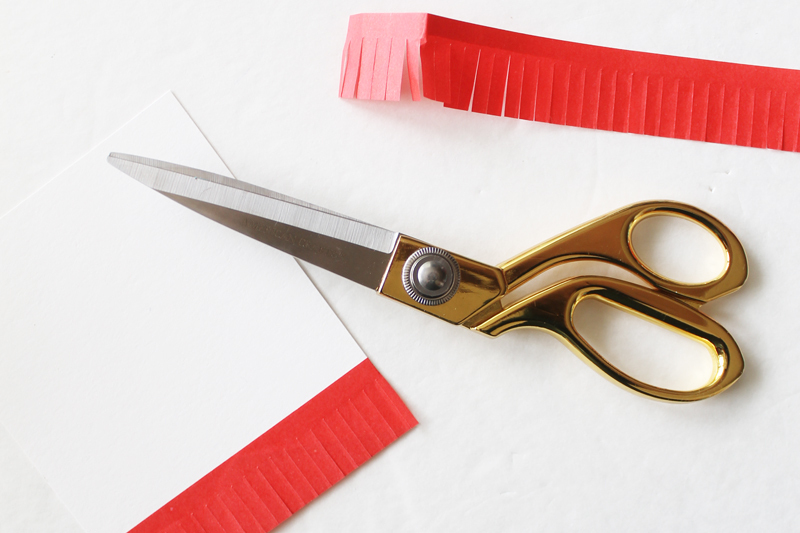 Trim the overall banner length to five inches long. You will again need four of these. Starting at the bottom of your five inch banner shape, begin layering rows of fringe tape to cover the banner shape. Trim the ends with scissors. Once you reach the top, trim the excess fringe from the bottom of the banner. Punch holes in the top of the banner shape. Fluff the fringe a little before proceeding to the next step. I did two with Blossom fringe and two with Ocean fringe. Start stringing your banner together. Use a piece of ribbon and a piece of coordinating twine and tie the banner pieces together using a double knot. Alternate pink and blue ribbons. On the ends, simply tie a knot at either end. 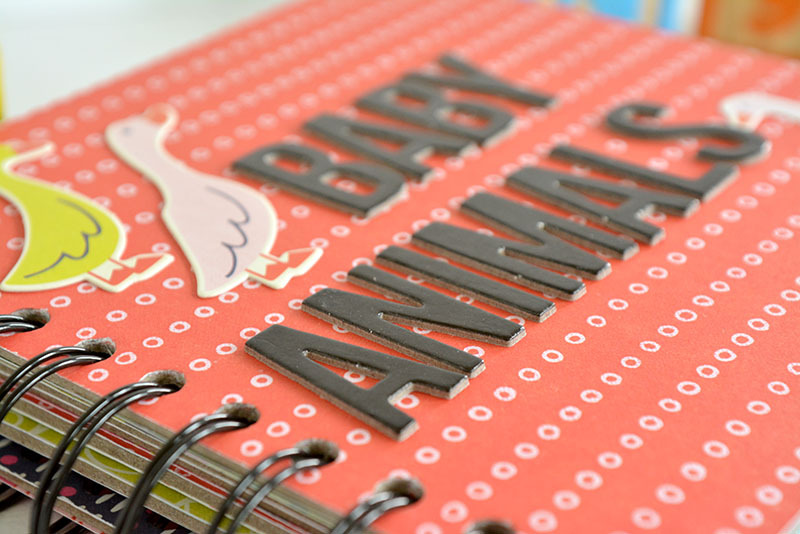 Using the Alphabet Punch Board and the 3 x 5 in Basics Paper pad, cut out the word BABY, alternating pink and blue papers. 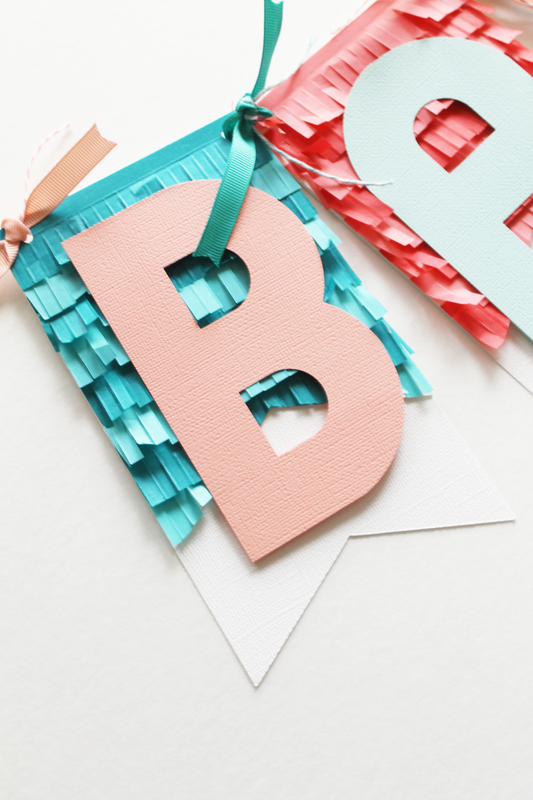 Attach the letters to the banner using adhesive foam squares. 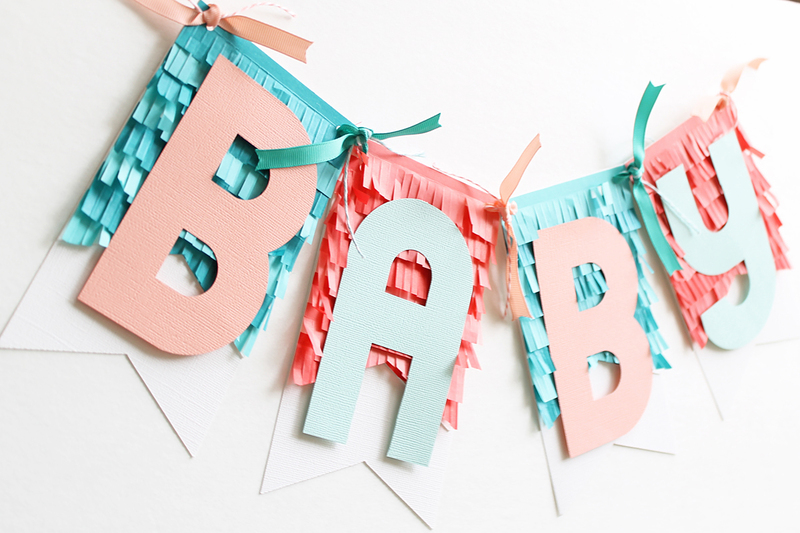 This banner would be wonderful for a gender reveal party since it is both pink and blue. However, the general design of the banner could be easily altered with all of the options for colors of Fringe Tape to suit any party decor. Hi Everyone! Amanda here today. 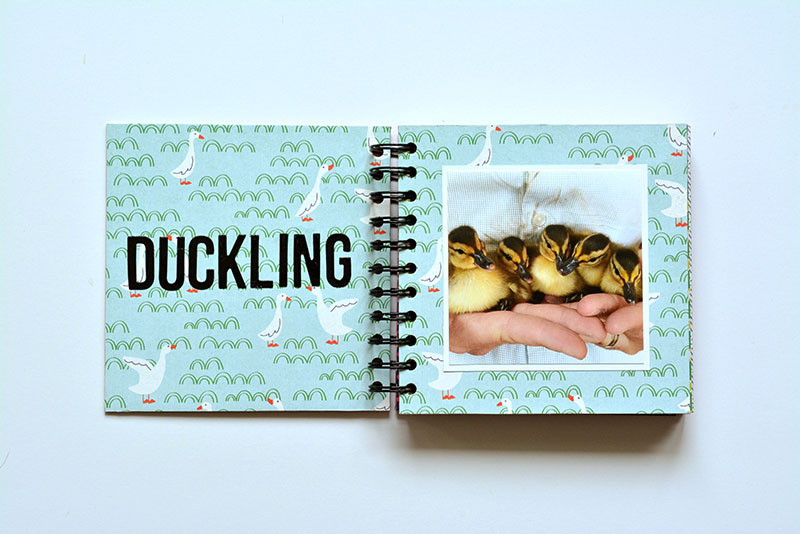 Although my kids, ages 9 and 11, are not into baby board books anymore, a fun way to capture memories is by creating a baby board book. 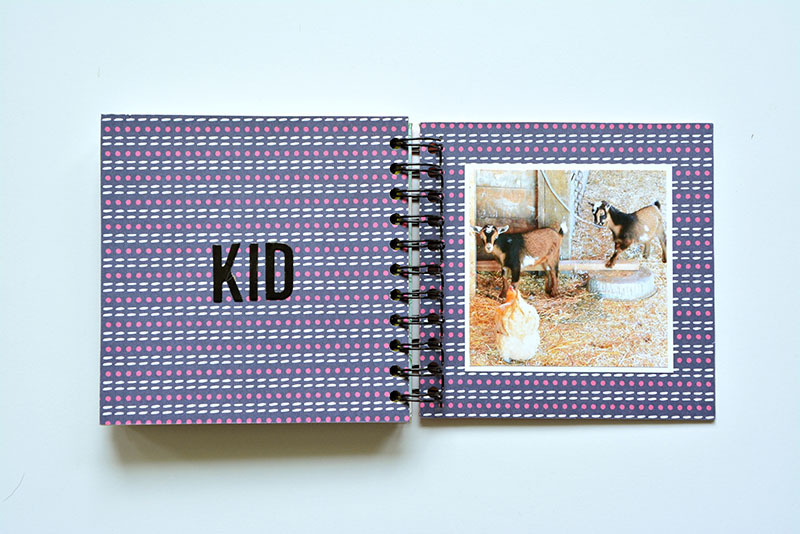 The fun pictures and bright colors will make story time fun and easy. 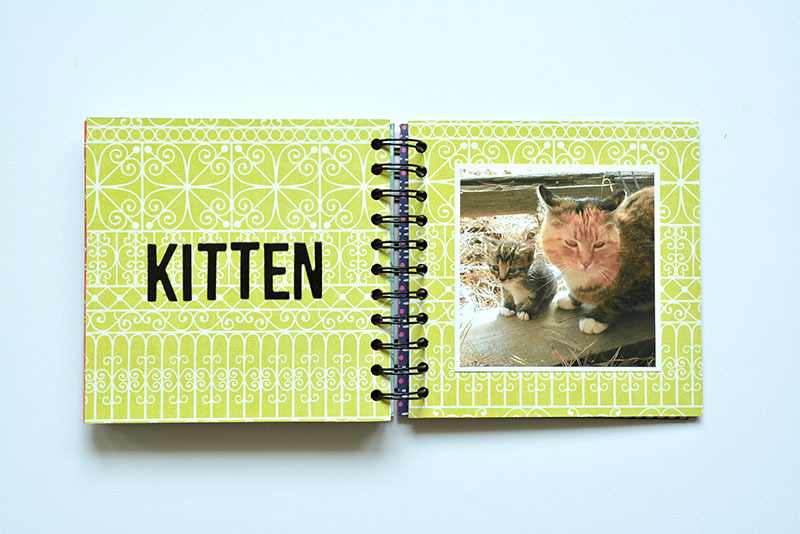 If you don’t have photos of animals, you can make a baby board book with pictures of family members, or even a trip to the zoo. The possibilities are endless! Think letters and bright colors, too. 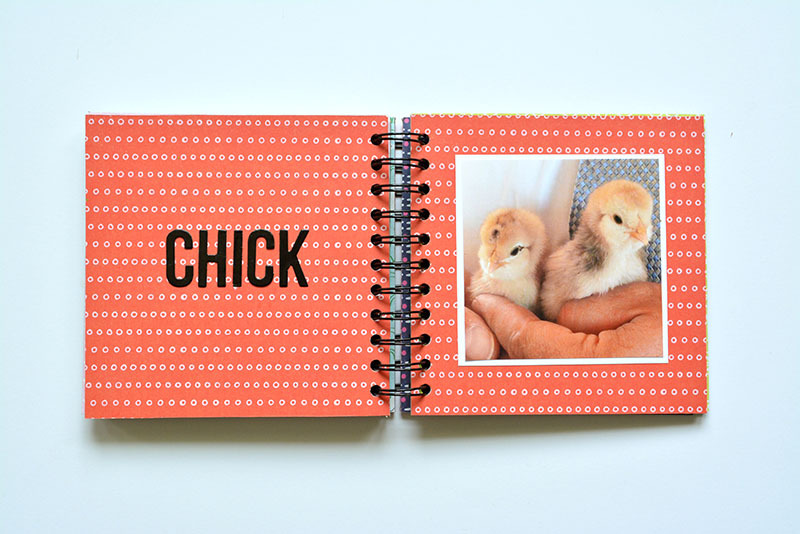 And since each page is made using a 6”x6” Cinch book board, the baby book is nice and sturdy in little hands. 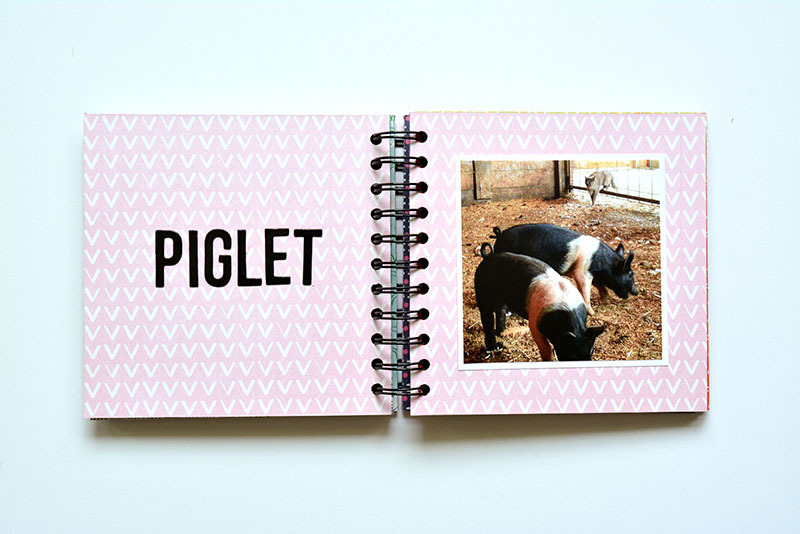 This book is filled with photos of baby animals we have had at our little farm over the past few years, and although I am not having to teach them animal names and sounds, my kids still enjoy flipping through these little books. 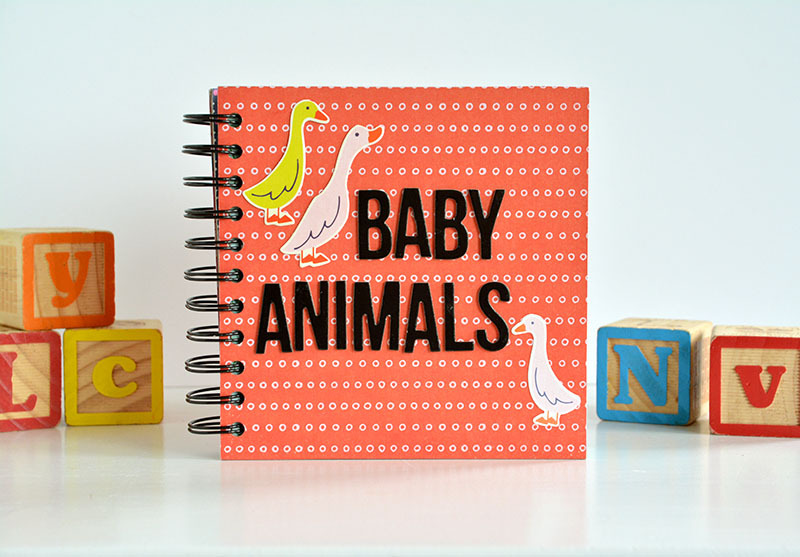 Creating a title using dimensional Thickers is not only an easy way to create a title for your book but will also add some bumps and ridges for baby’s hands to run over. 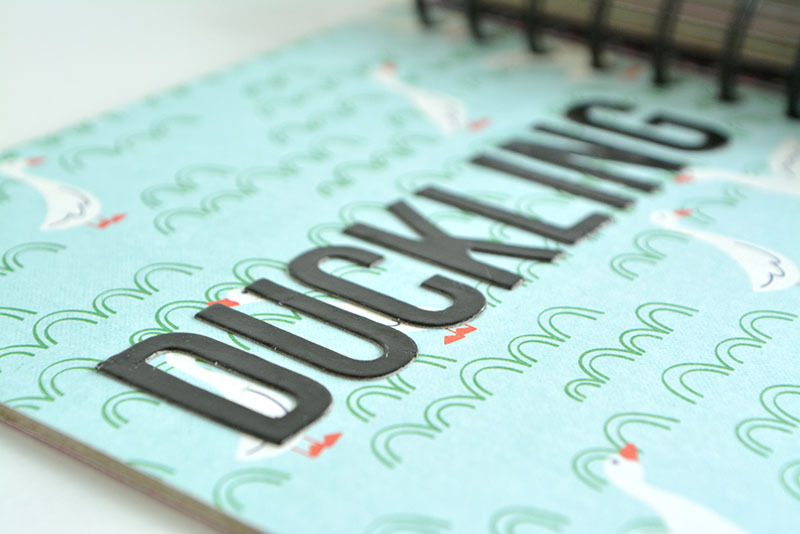 You can also use Thickers to create the words for your book. While they look great on the cover, the thickness of the Thickers may add unwanted bulk to your book. I came up with a little trick for getting all of the convenience of Thickers, but without all of the bulk. You know that moment when you peel a chipboard Thicker from the sheet and the top of the Thicker comes off but the sticky part remains? Well, it’s time to put that skill to good use. 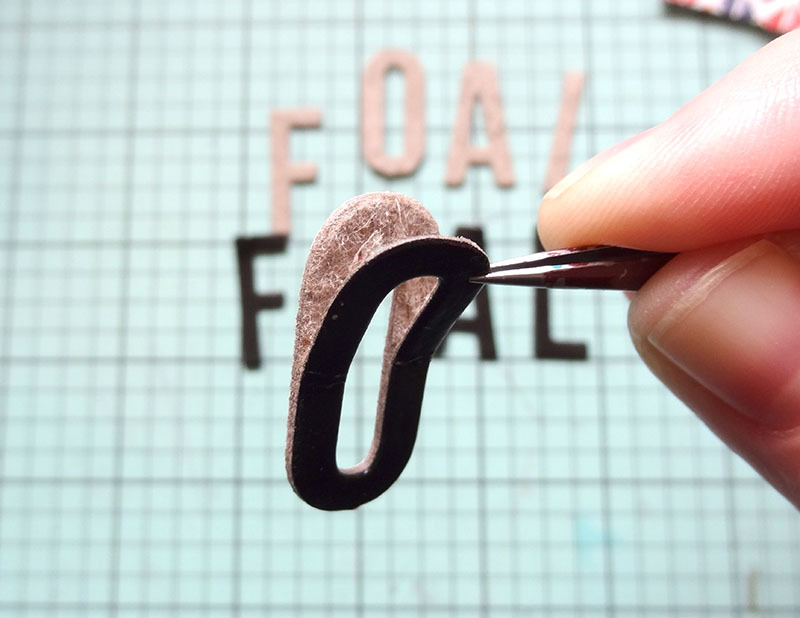 Using a pair of tweezers, gently separate the top few layers of the Thicker from the bottom portion and voila! You have a nice, thin alpha to use in your book. Simply adhere with some liquid glue and you’re good to go. 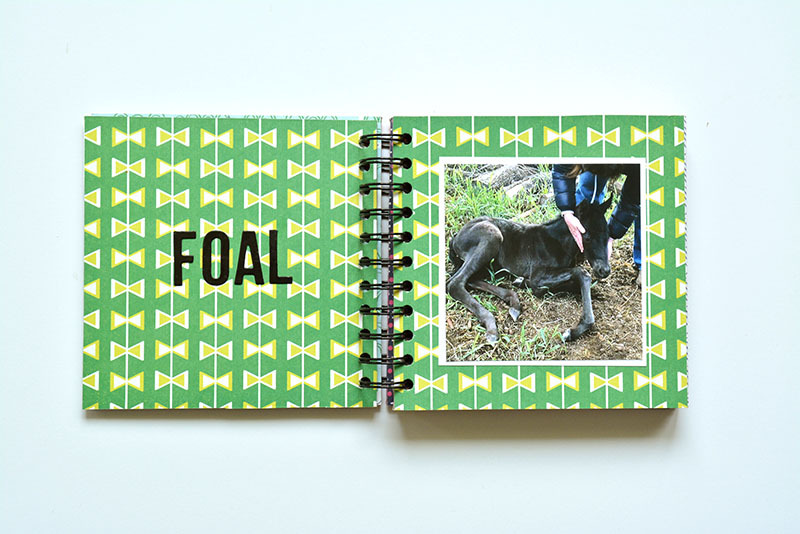 The types of board books you could make with the Cinch are endless. Have fun! 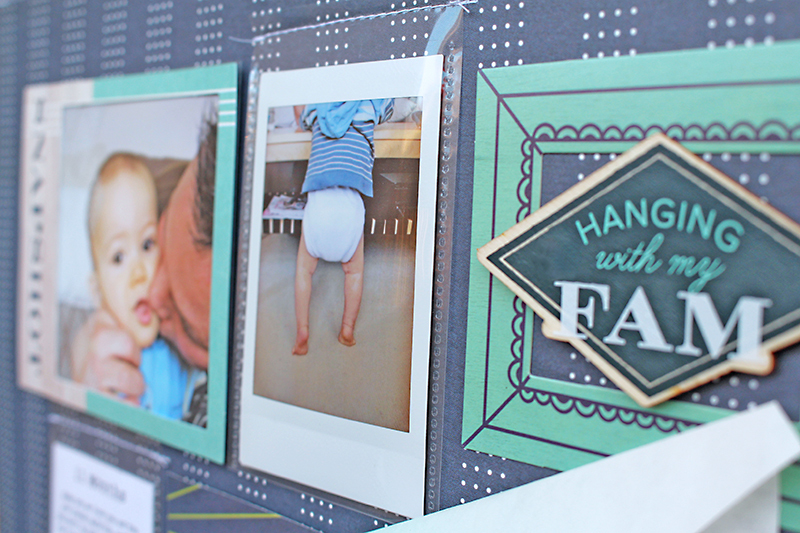 We’re celebrating sweet little ones all week long on the blog with Baby Week! 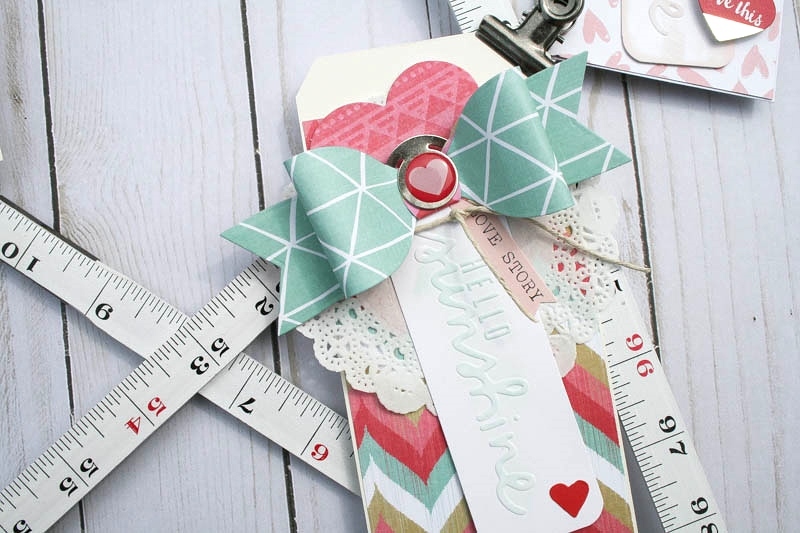 Our team has created some adorable inspiration for gifting, party decor, DIY projects and more. So, be sure to check in often this week so you don’t miss out! Hello everyone, Wendy here today to a few tags I created to welcome a new baby, boy or girl. 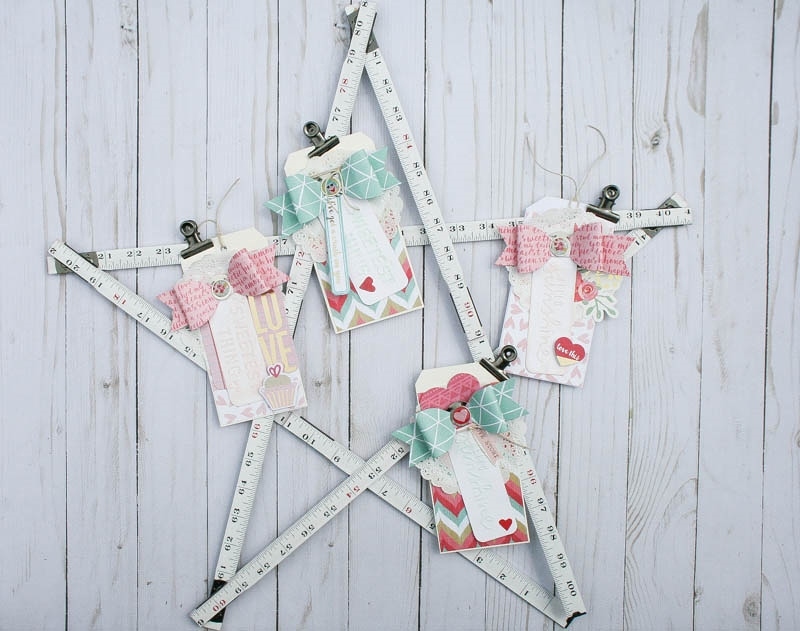 I created a star from the ruler studio to display the tags, or any other fun pieces that seem to accumulate when a baby comes. I began my tags by cutting out a few bows in boy and girl colors using my Evolution. The Crush Paper Clips were perfect little additions to add to the bows to allow me to clip a few items together for my tags. My next step was to create some fun little sentiments for my tags. 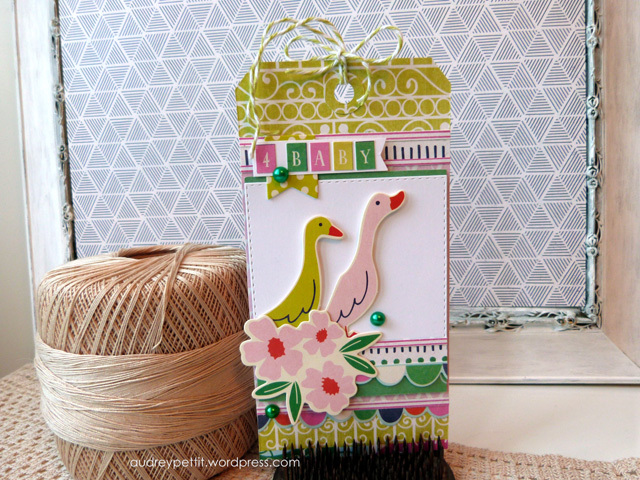 Using my evolution and the Rise & Shine embossing dies I was able to quickly add sentiments to my tags. I used some inks to further highlight the sayings. 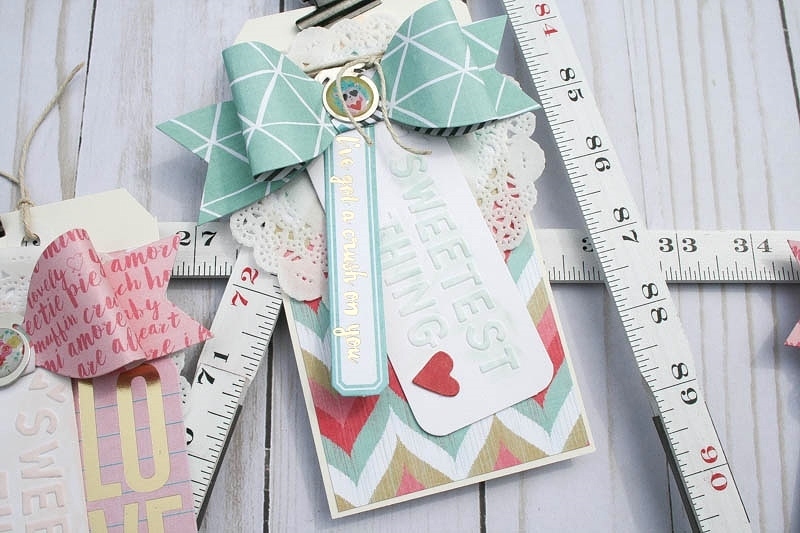 To keep the process simple on my tags, each tag had a sentiment, a bow, a doily (to add a soft baby touch), patterned paper, and a few fun pieces to dress up the tags. My last step in creating my tags was to add in ephemera and stickers as needed to dress up the tags so that they were display worthy on the star ruler studio piece. Each of my kids has a box of little mementos which I have saved for them. I hope these tags will end up one day being saved for someone else’s mementos and always bring them joy to look back on! Hello We R Fans! 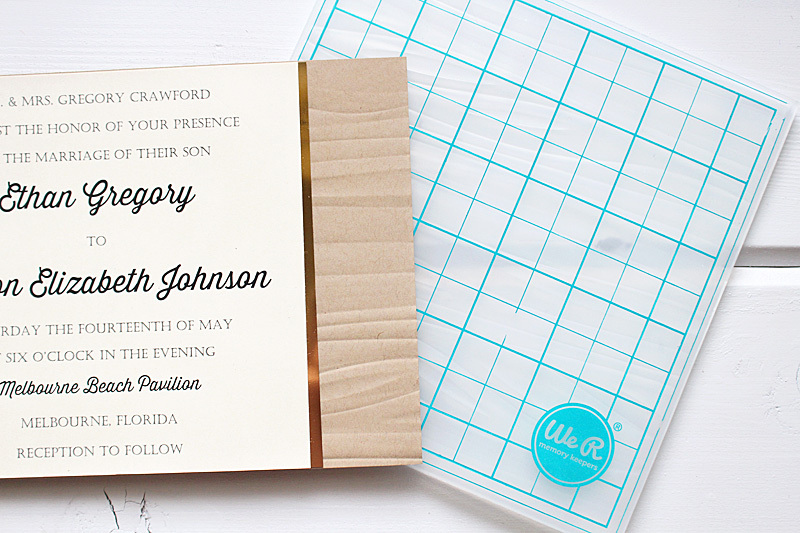 Kimberly here with a fun way to send a wedding invitation. 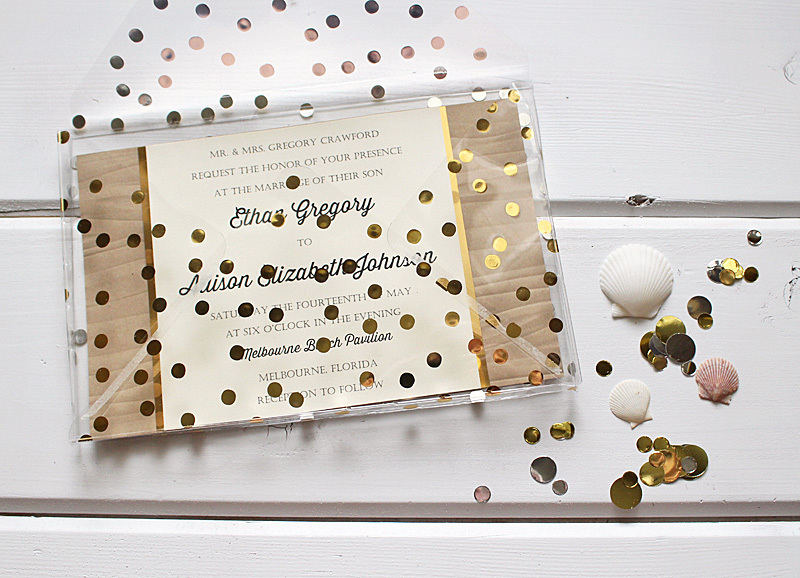 Wedding invitations are the first impression guests will get of your upcoming wedding. 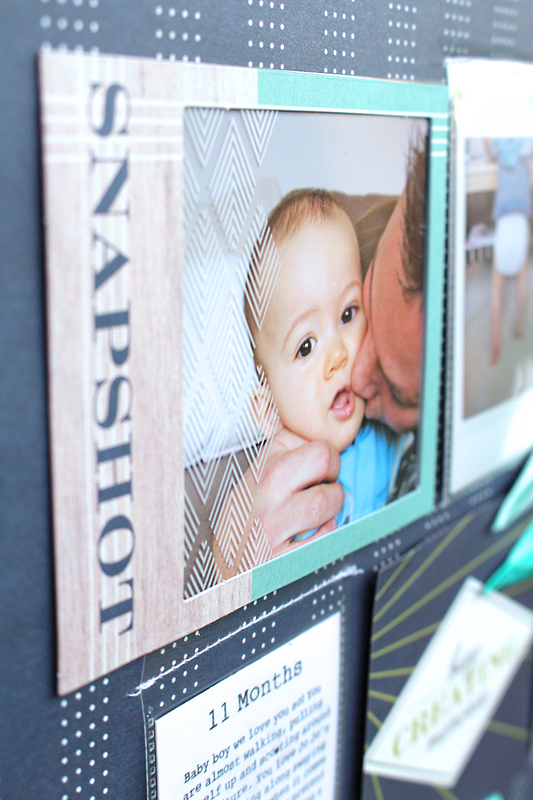 Creating a unique and memorable invitation is easy with a few tools and supplies from We R Memory Keepers. Before starting the invitation, I looked at my 1-2-3 Punch Board size chart to see what size envelopes I could possibly create. 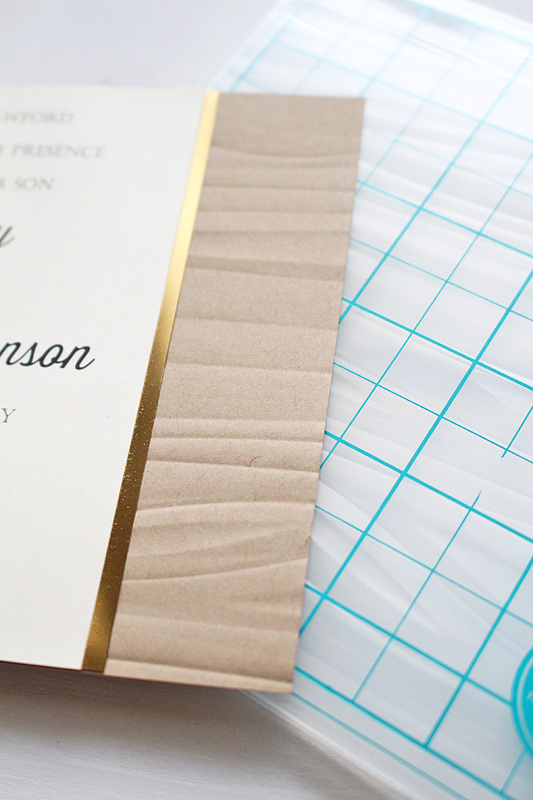 When I chose the 5” x 7.5” envelope, I was ready to begin making my invitation. I printed my information out onto specialty paper. On the back, I layered a piece of gold paper for an elegant touch. 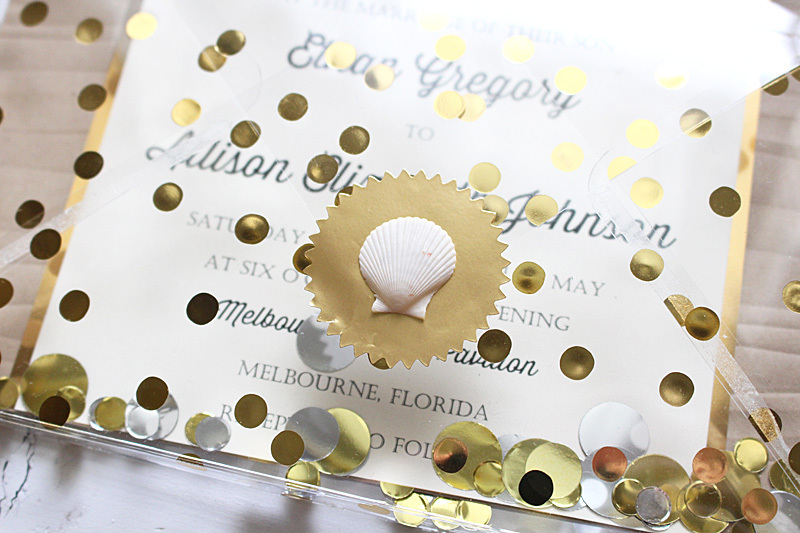 Because this will be a destination wedding, at a beach, I thought using the Next Level Embossing Folder Wave would be a fantastic touch of texture. The embossing folder is not long enough to emboss the whole piece of cardstock, so I embossed one half and then the other. Where the two edges meet, the ridges will be covered up by the front and back panels of cardstock. The envelope for this invitation is where the whole idea started. I knew I could create an envelope that would be like a box, with tall sides. 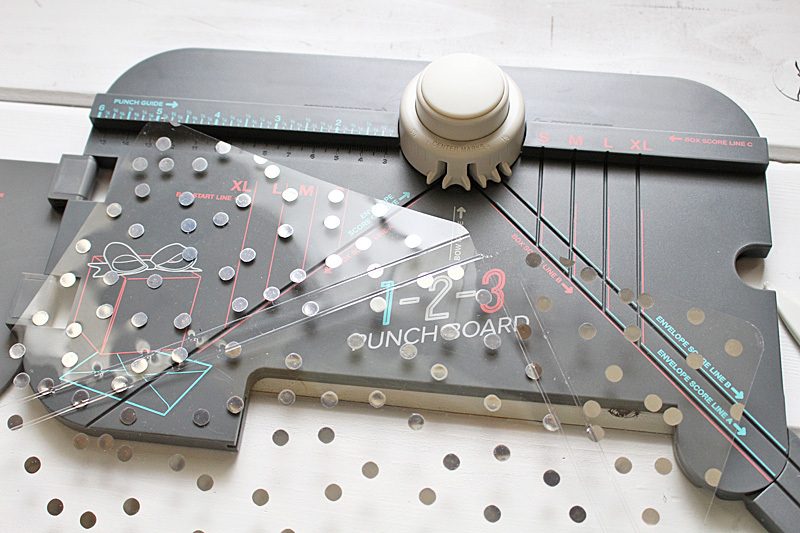 The 1-2-3 Punch Board makes it very easy to create. Using a sheet of Clearly Posh Acetate, I punched and scored the envelope according to the directions. 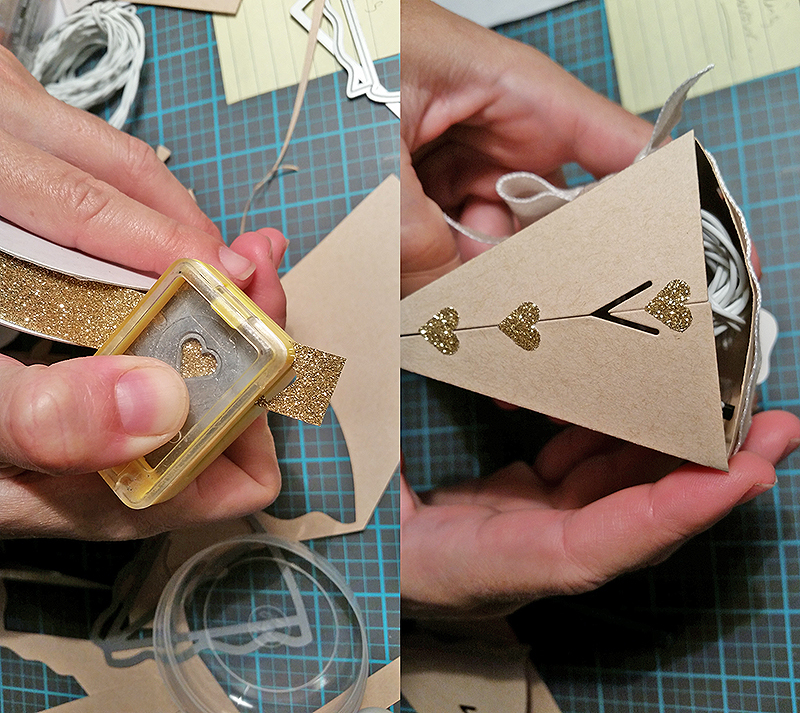 Once the sides were adhered together, I placed the invitation inside. 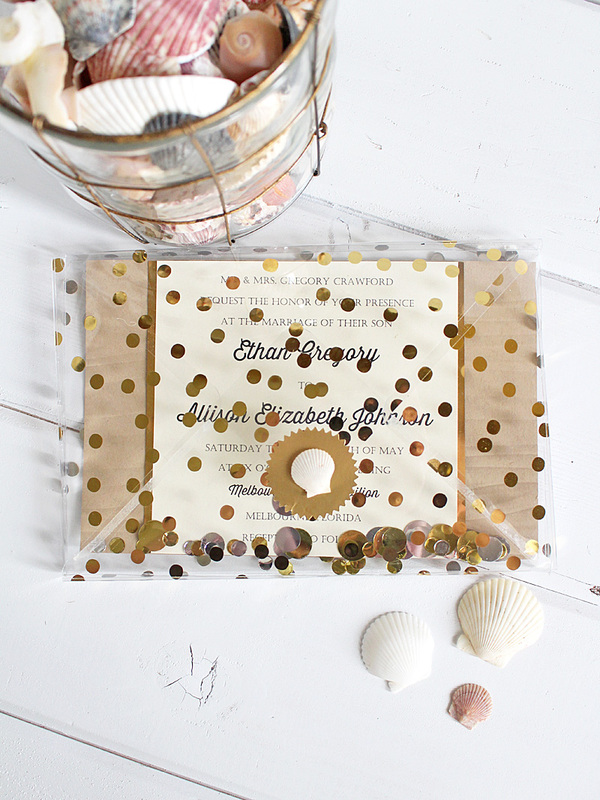 Because the envelope is like a box, I have space to add fun touches like DIY Party Confetti, or even small shells. To close the invitation, I used a gold foil sticker. Topped with a small sea shell, the look is complete. 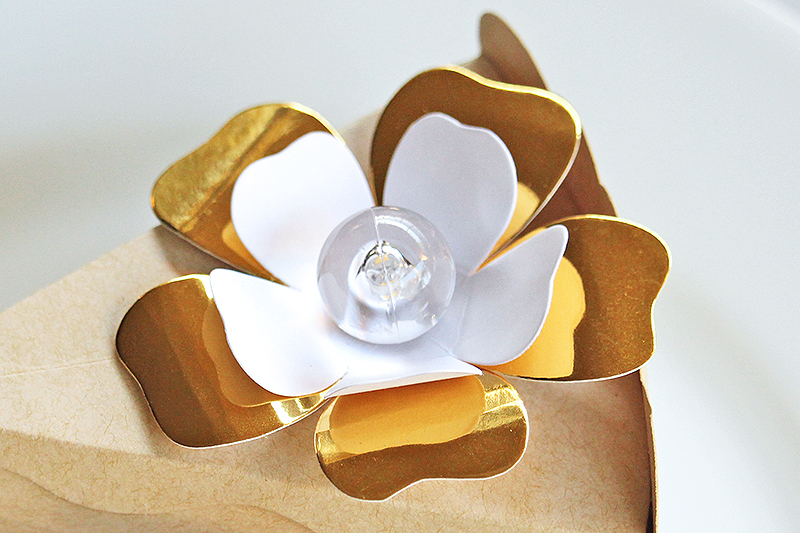 You can see the sides of the envelope and how it holds everything beautifully! Gather your fiancé, friends, and family and make fun afternoon of creating! Gather all the supplies you will need first, make sure you have enough paper, supplies, and adhesives. Be sure and have extras on hand for when mistakes happen. 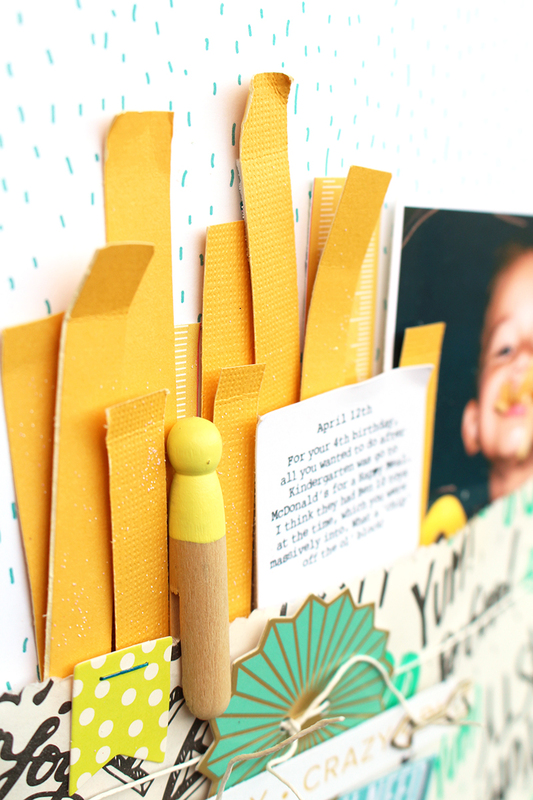 Create each part of the invitation all at once. Print all the invitations. Cut all the papers. Score all the lines, etc. You can give each job to one person. Hello We R fans! 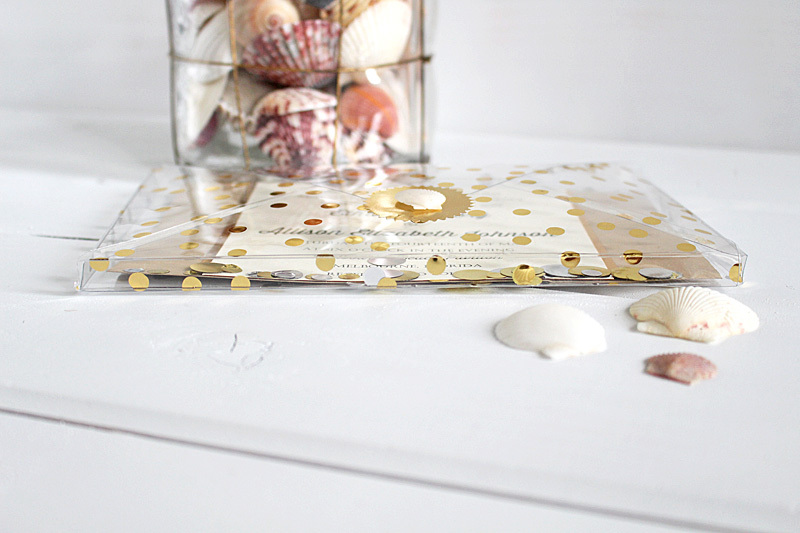 Chantalle here, and I’m very excited to share an idea for a special party favour with you. Using just a few simple supplies, you can create one in no time at all. 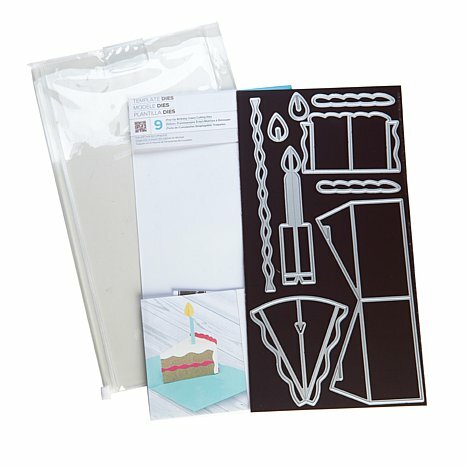 To create my cake shape, I have used the new Pop Up Birthday Cake die. One would ordinarily adhere this shape inside a folded card so that, once opened, it springs to life. By sealing the bottom of the shape, I have created a ‘solid’ slice. 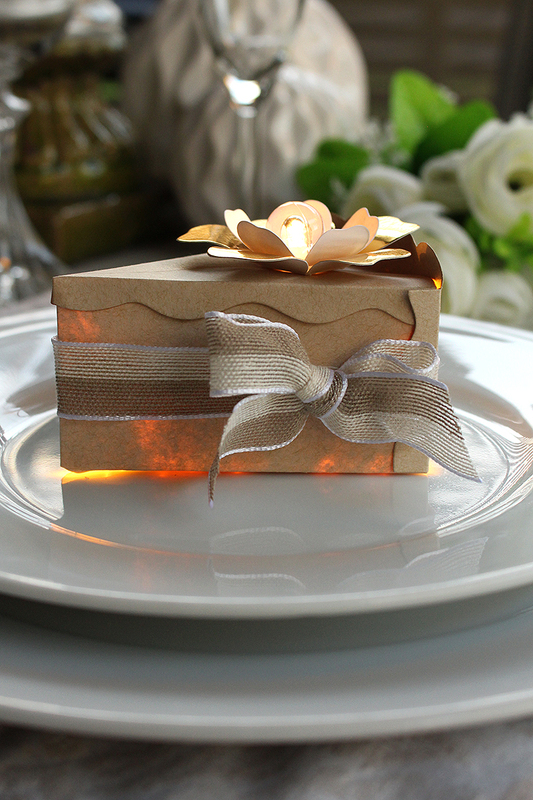 Leaving the candles off and using neutral tones has given this favour box understated elegance. The die set comprises of 9 shapes. The image below shows the pieces I have used from the set. You will notice, I have left out the candle elements. 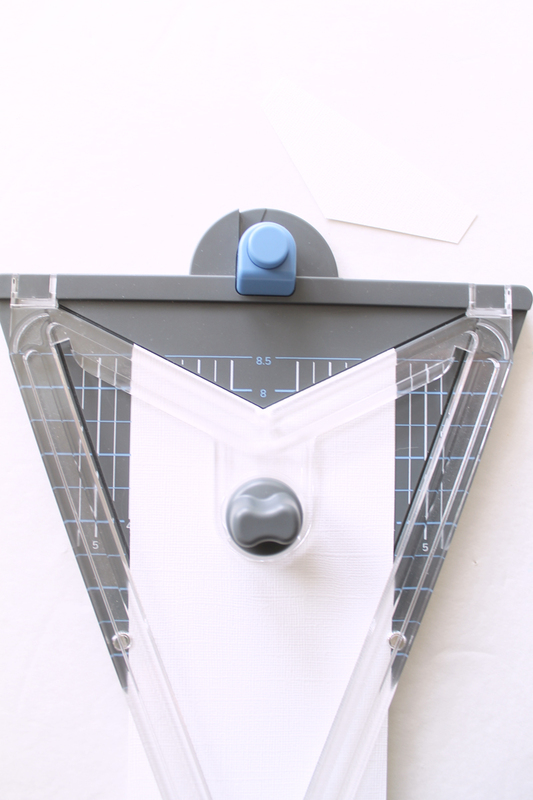 By spacing your dies efficiently on a piece of 6x12inch cardstock, you can cut two lots of shapes from one 12×12 sheet. 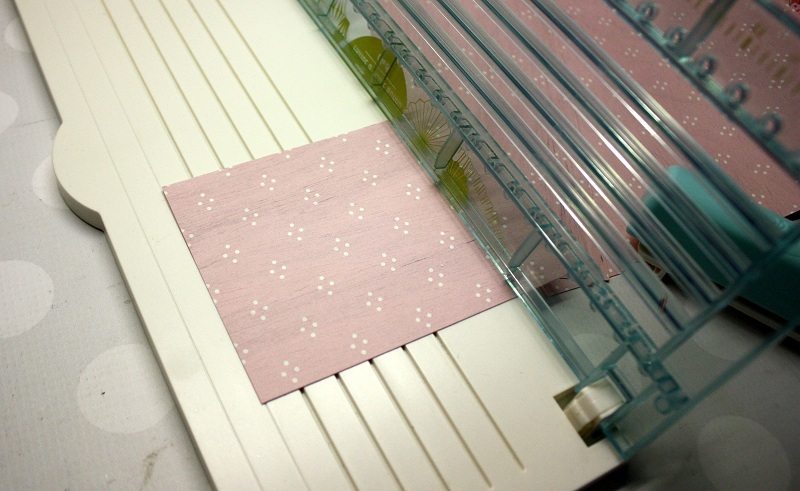 The Evolution Advanced magnetic cutting mat is great for this job, as you simply lay your dies on the mat, which will hold them in place for you, so no slipping as you run your paper though the diecut machine! Assembling the cake is very straightforward. What I love about WRMK products is that they come with great step-by-step instructions. This die set is no exception. 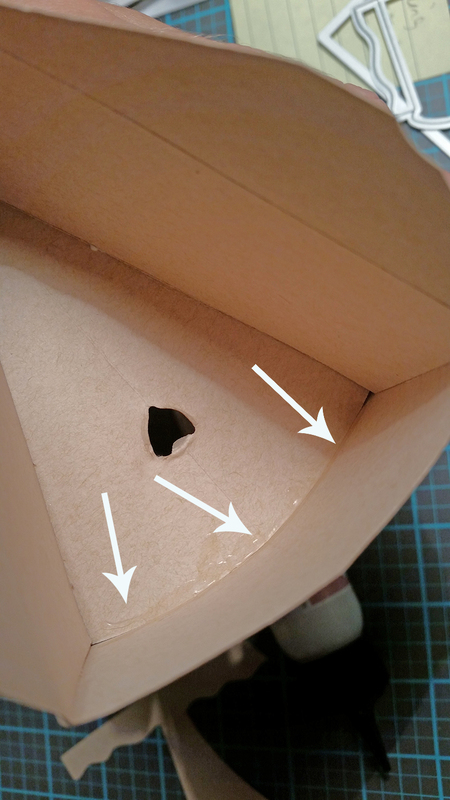 To seal the little gap where the cake meets the icing on the wider side, I have opened the box up and run a line of wet adhesive, then pressed the edges together gently. (see arrows) The reason I have done it on the inside is so that it won’t be visible from the outside. I don’t want anything spoiling the view of what I have planned for the top! Once the glue was dry, I filled the inside with a strand of Ruler Studio lights. It just so happens the length of the cake fits the battery pack inside perfectly! * Make sure to include batteries for your guests. Next, I flipped it right side up and fed one of the little light strands up through the hole that was already in the cardstock from the die. (This is where the candle would slot in). 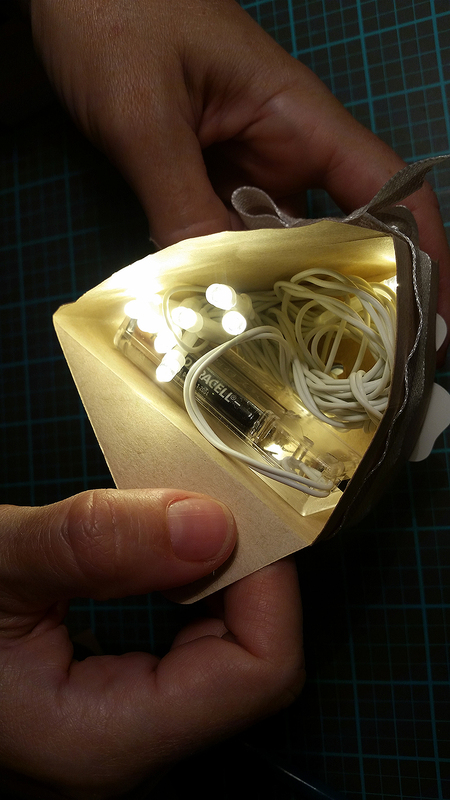 The DIY Party range now includes some absolutely gorgeous new light strand bulb covers. 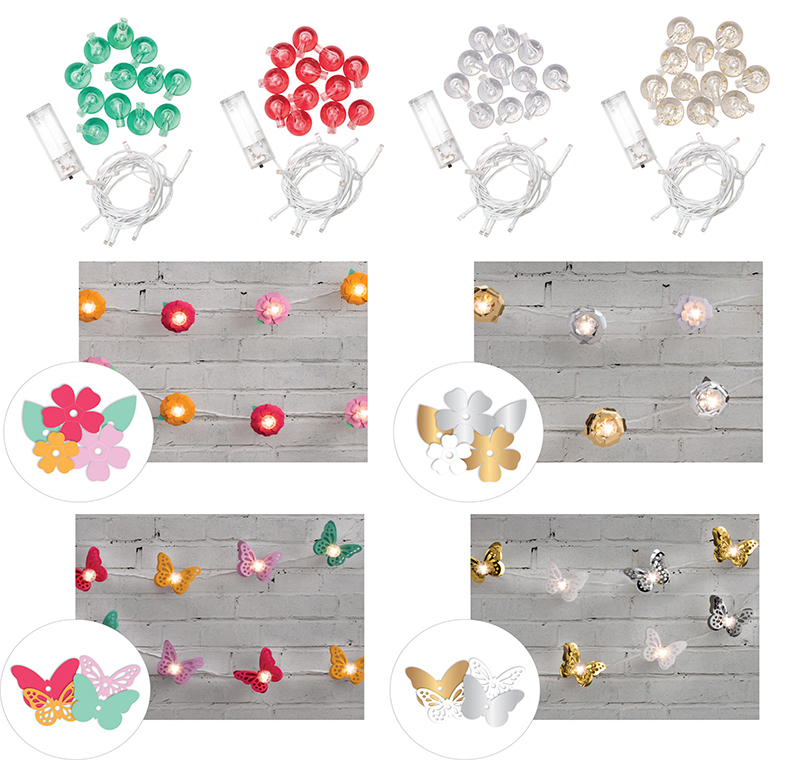 Stars… lanterns… butterflies… and all in a selection of colours. 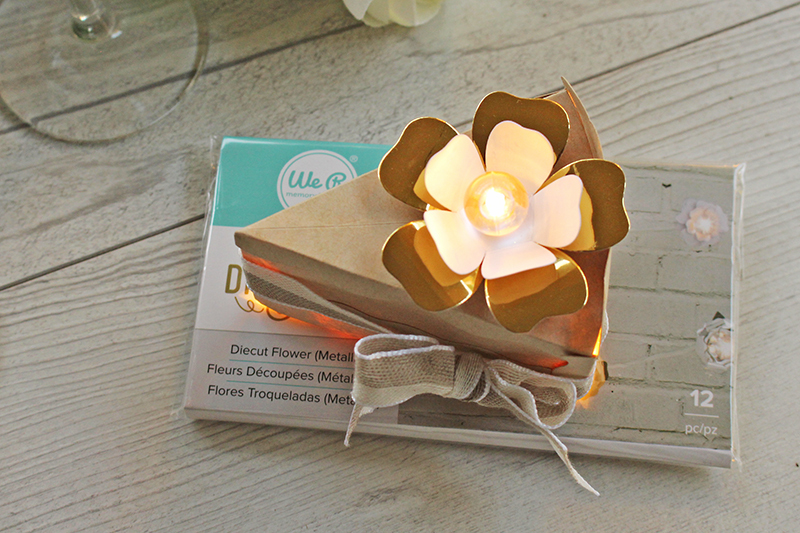 I’ve chosen to work with the Metallic Die Cut Flower covers for this project, grabbing a large gold foil and smaller white flower. Just layer the shapes up and pop a clear bulb through the centre. This then fits over the little led light. Note: Push it on well for a secure fit. With the lights now in place, I just sealed up the bottom using a heart-shaped punch and some American Crafts Glitter Tape. Here’s a peek of that beautiful bloom in the better light. Love that gold foil! 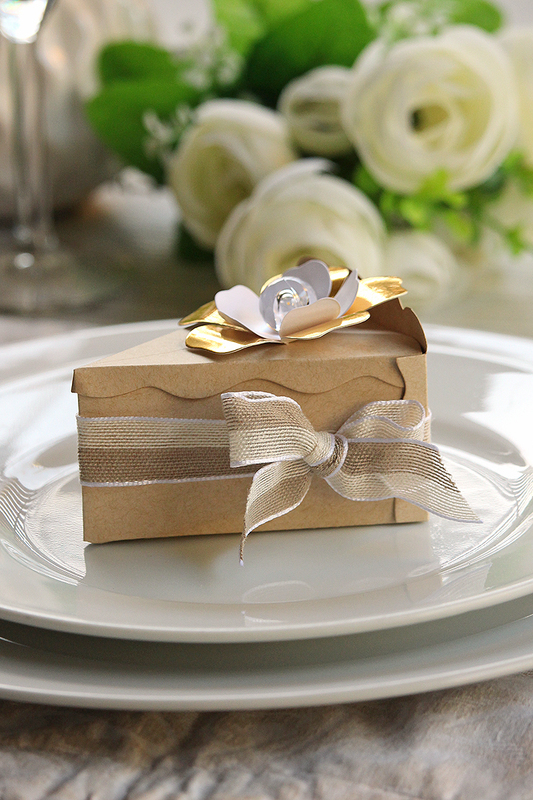 When you are ready to give your favours to your guests, simply open the box up and turn on the lights. I love the warm glow from within. It would definitely add a romantic charm to a wedding reception table setting. 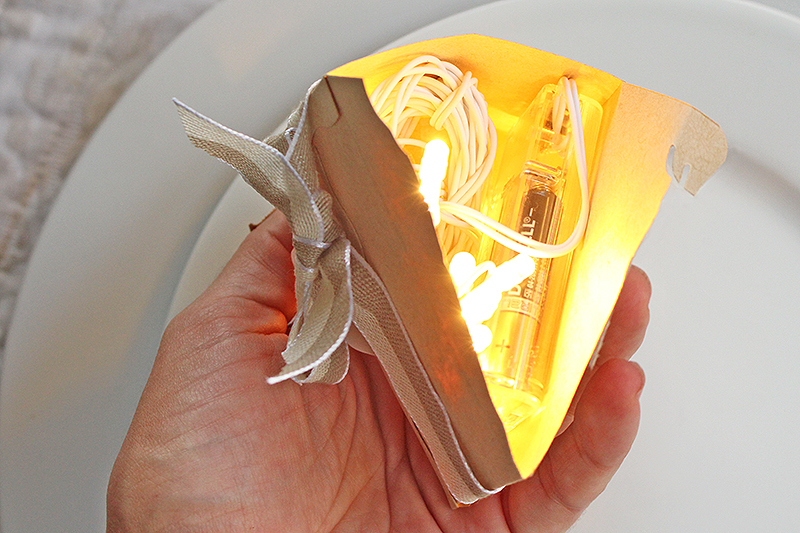 You could choose to include the bulb covers from the start or hand them out to guests at a later point. Now they get to have more fun at home! The best part of this idea is that it’s so easy to customize. Brighten up the card colour for a birthday and combine with colourful butterflies or keep it tonal for a baby shower. So many possibilities! Thank you for joining me today. 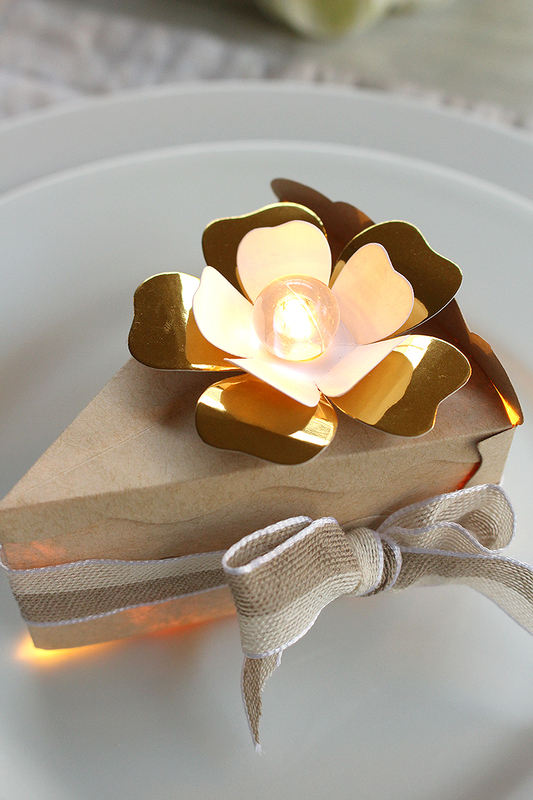 I love this little light up favour so much, I wish I could have my wedding all over again!